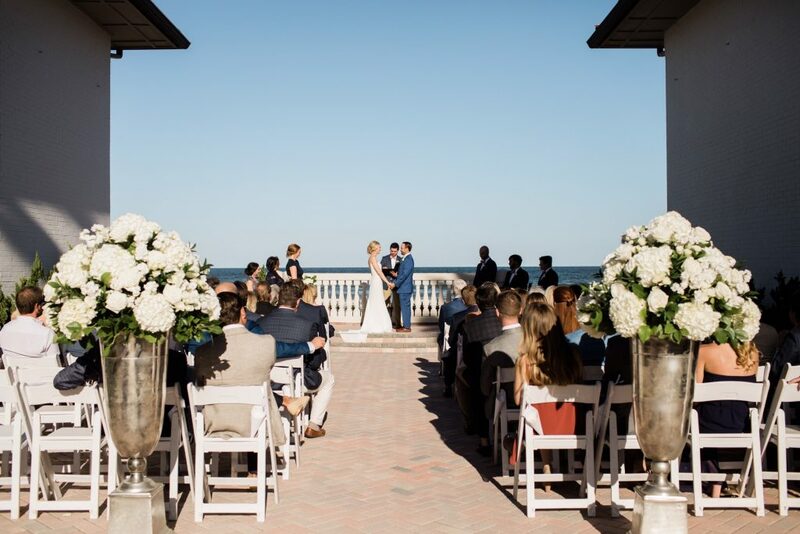 Timmons and Michael has a beautiful wedding and reception at the Ponte Vedra Inn and Club. 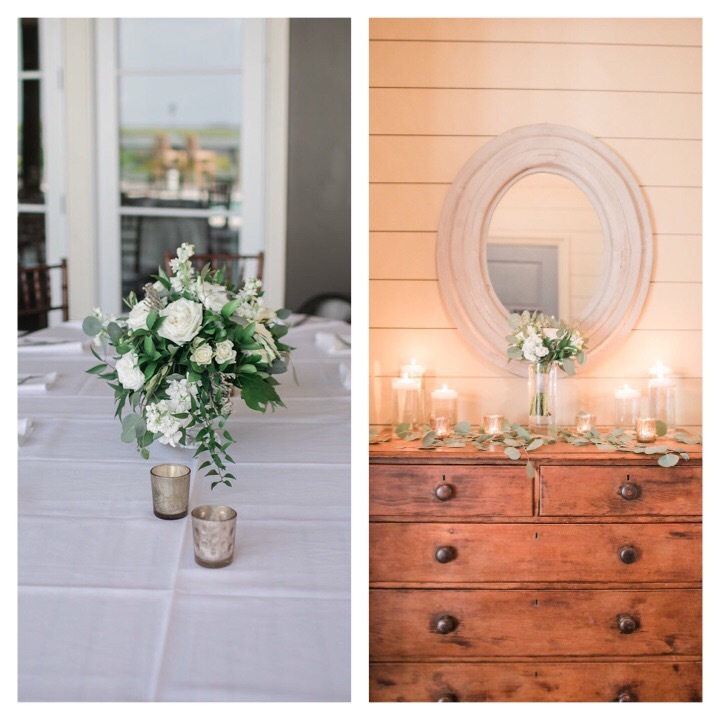 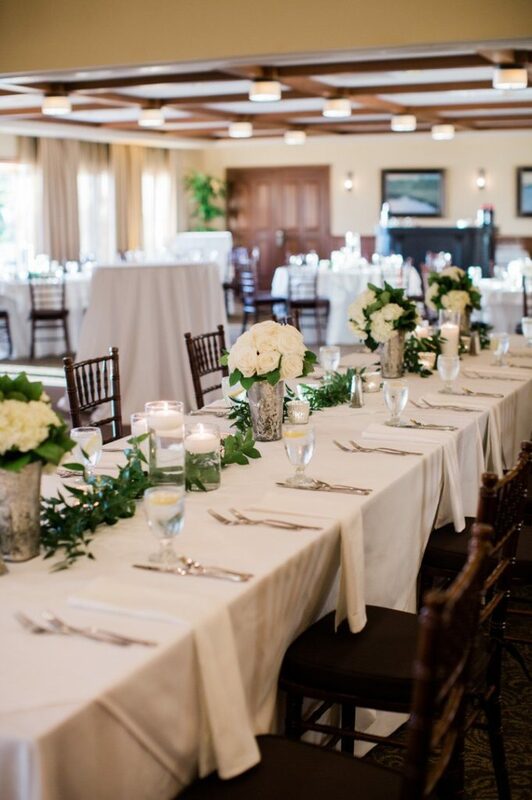 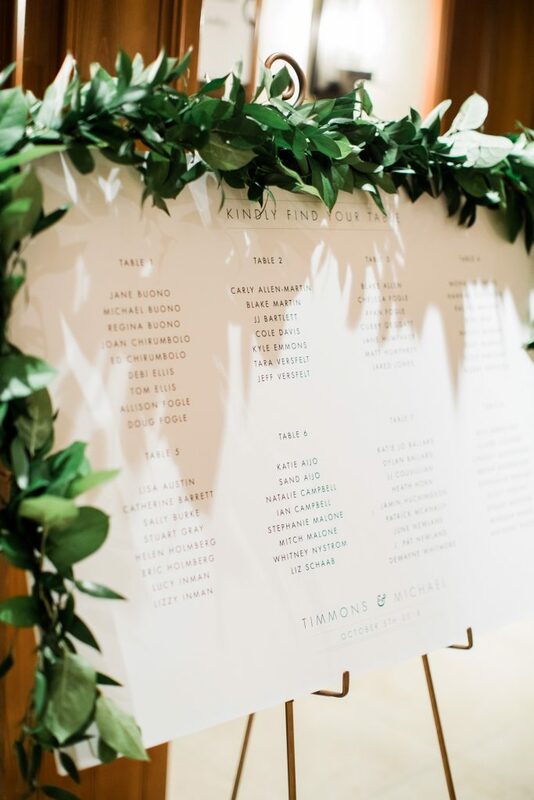 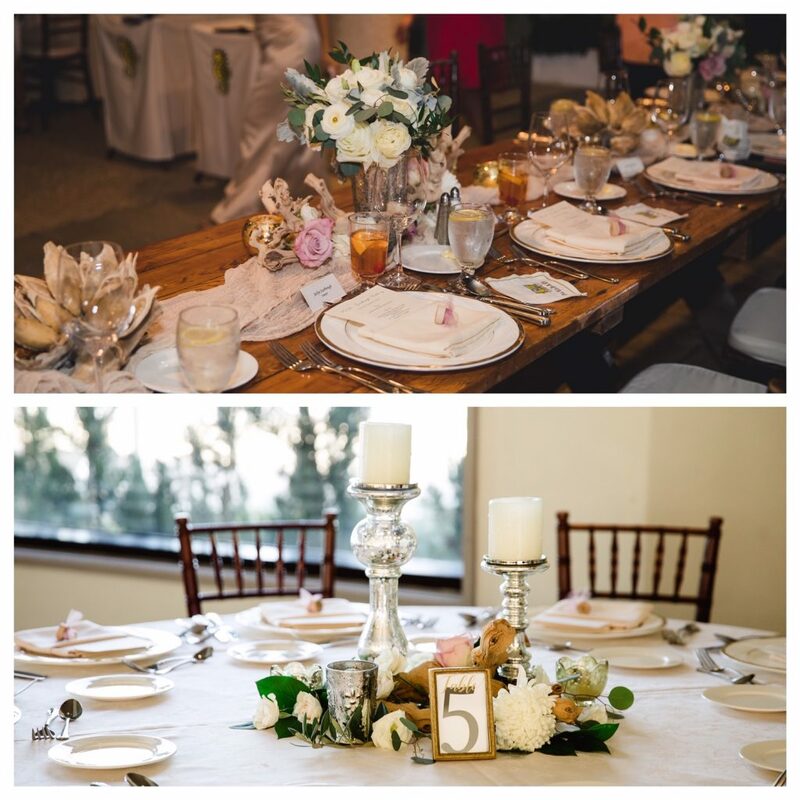 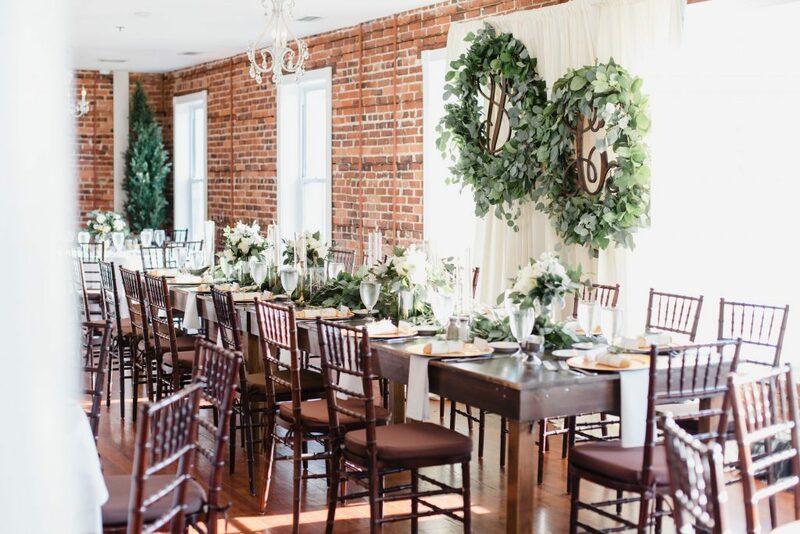 We loved Timmons simple yet stunning vision of greenery and white. 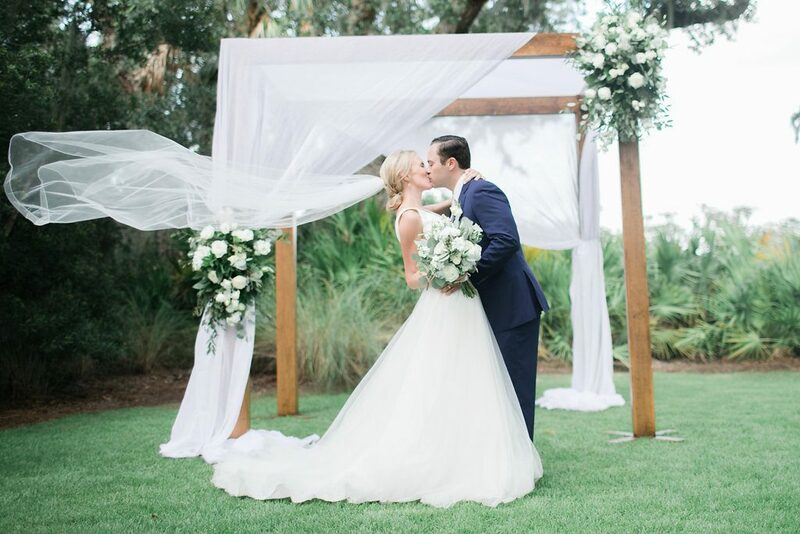 Their wedding and reception was full of romance and gorgeous florals. 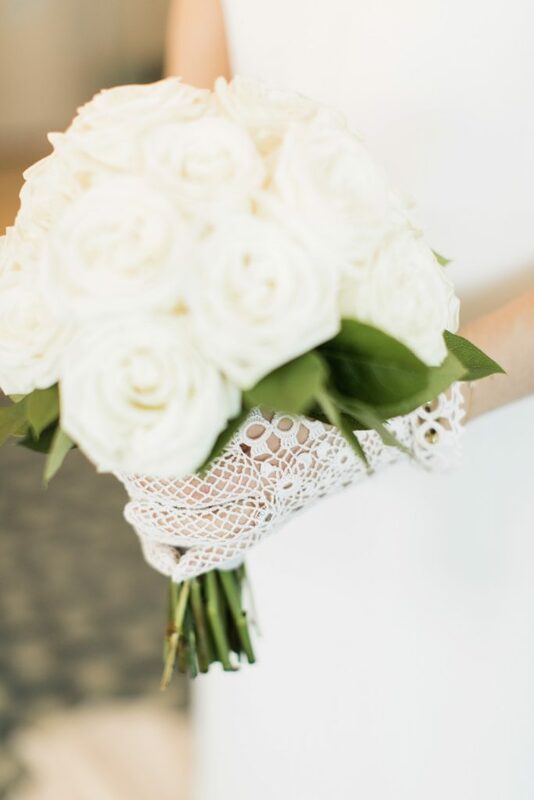 Beautiful nosegay bouquet created with white roses and touches of ruscus and salal. 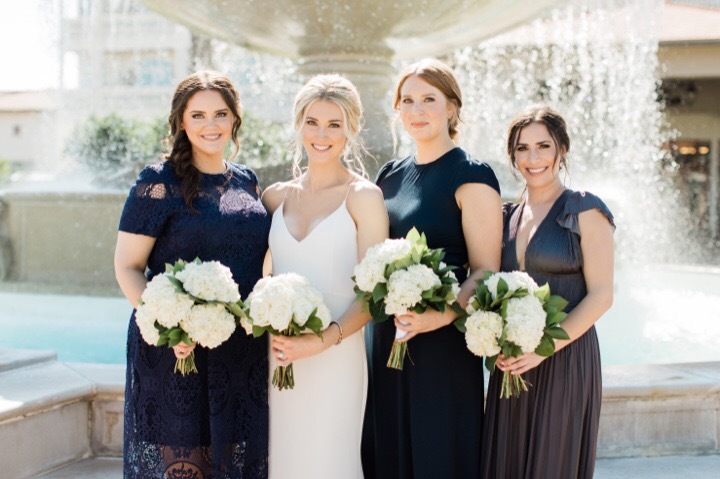 The bridesmaids carried bouquets of hydrangeas accented with ruscus and sala. 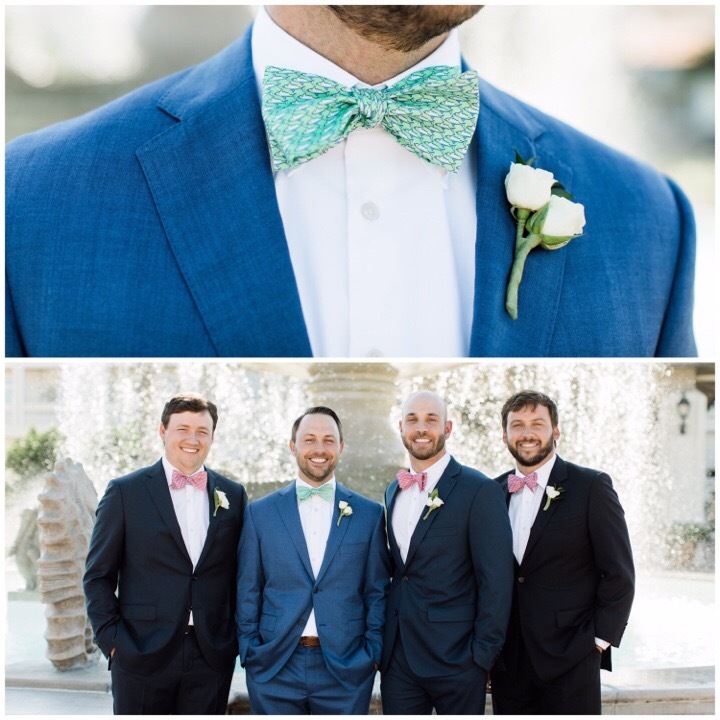 Michael and his groomsmen wore boutonnières of spray roses and ruscus. 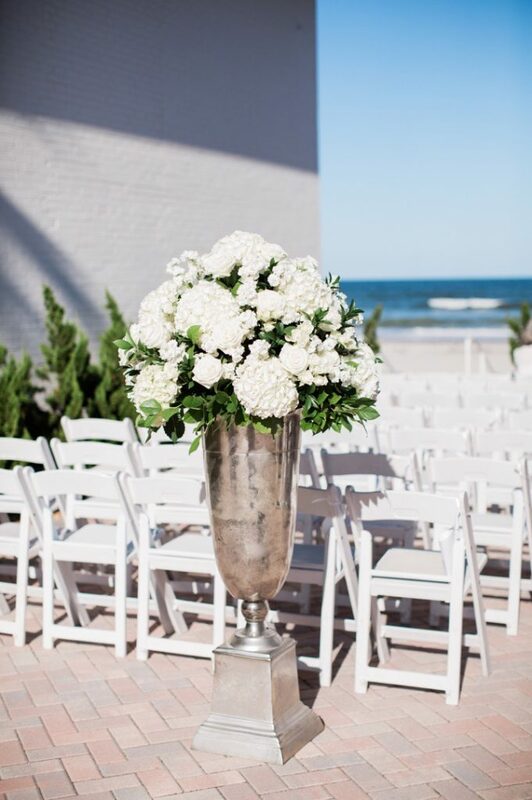 Stunning arrangement created in silver urns were placed at the aisle entrance. 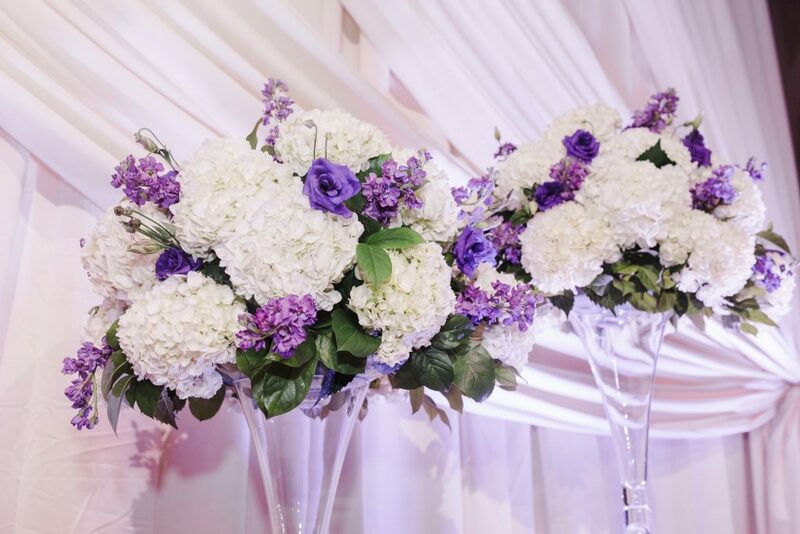 The arrangements were made of white hydrangeas, roses, stock and mixed greenery. 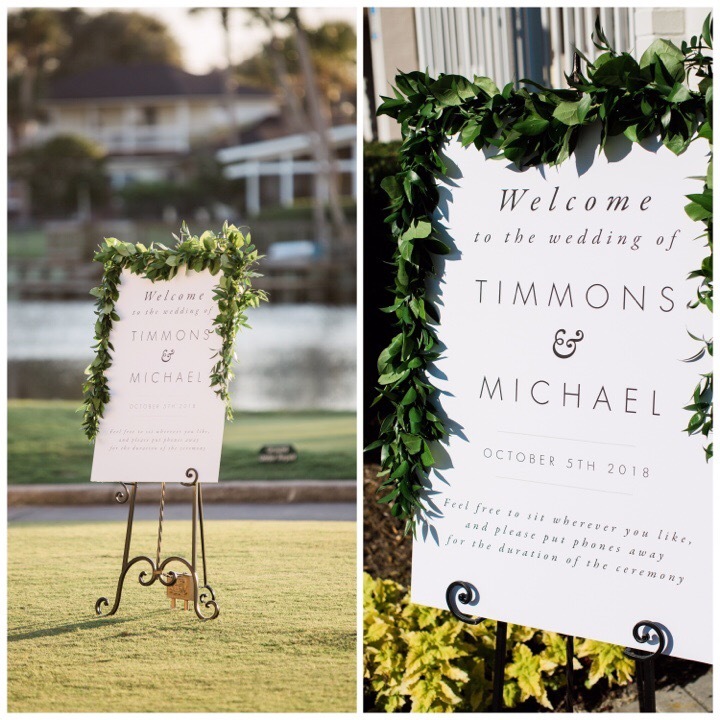 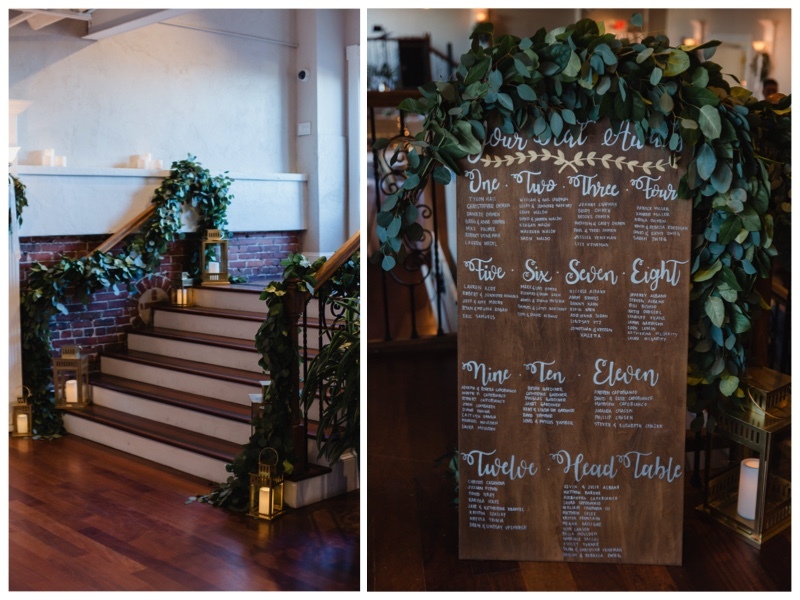 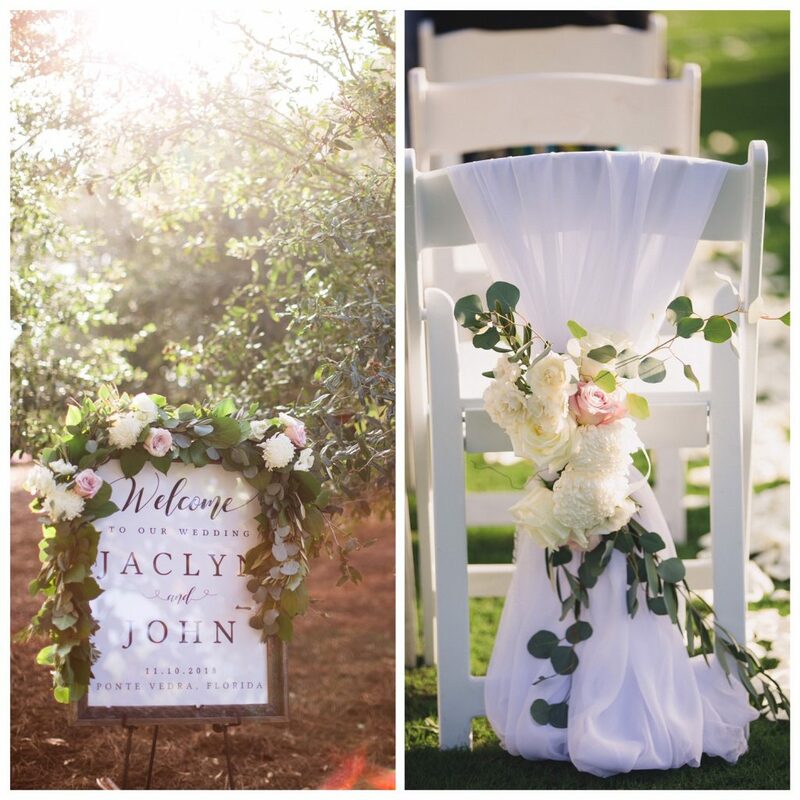 A sign draped with beautiful greenery welcomed guest to the wedding. 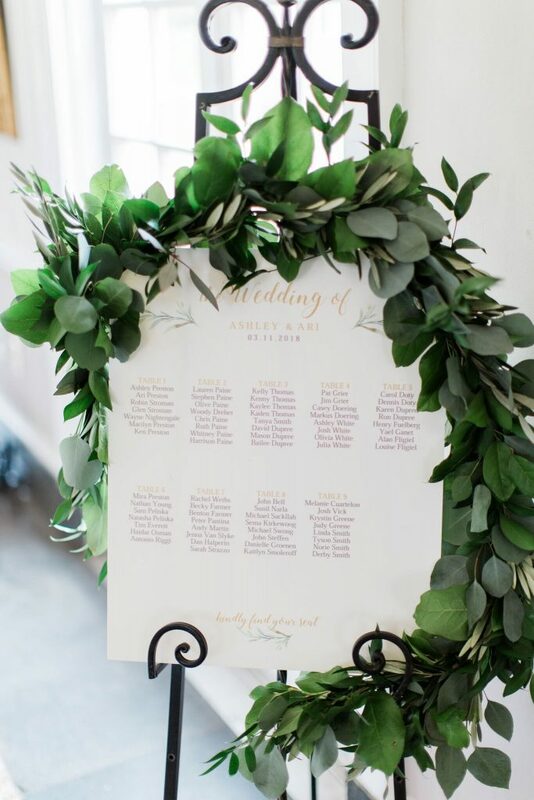 We love how draped greenery adds romance to this seating chart. 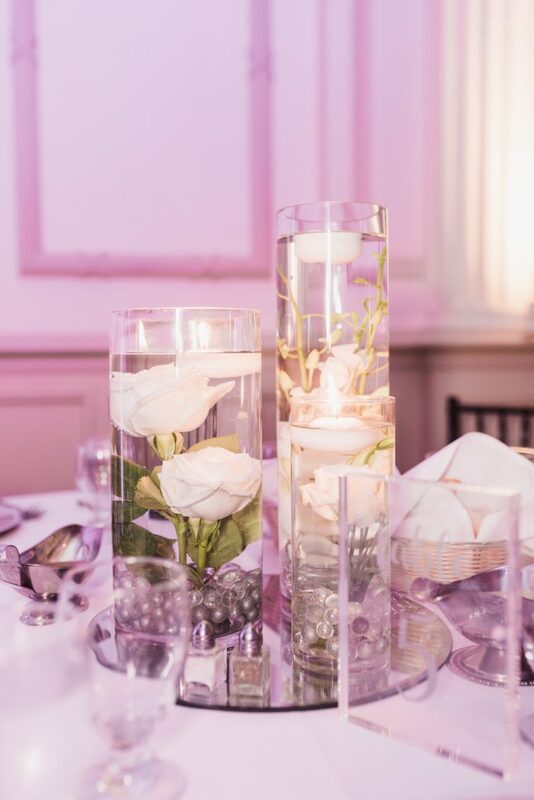 The floating candles in these composite centerpieces added romance to the reception. 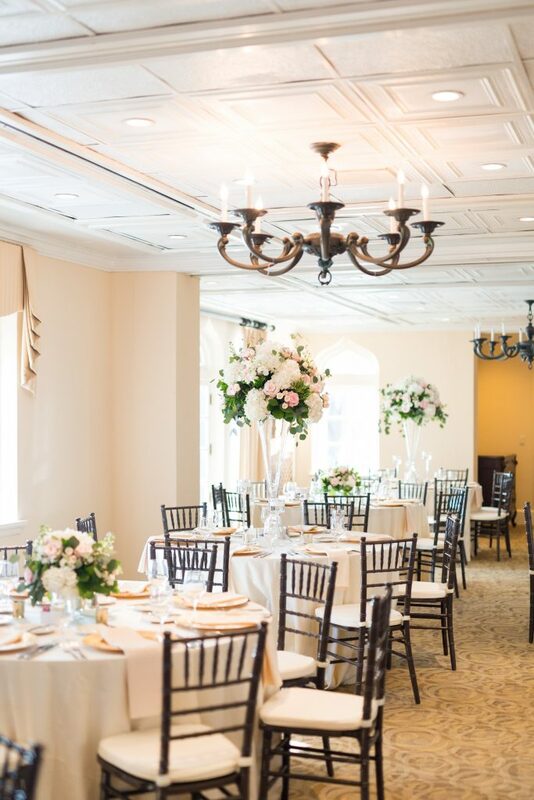 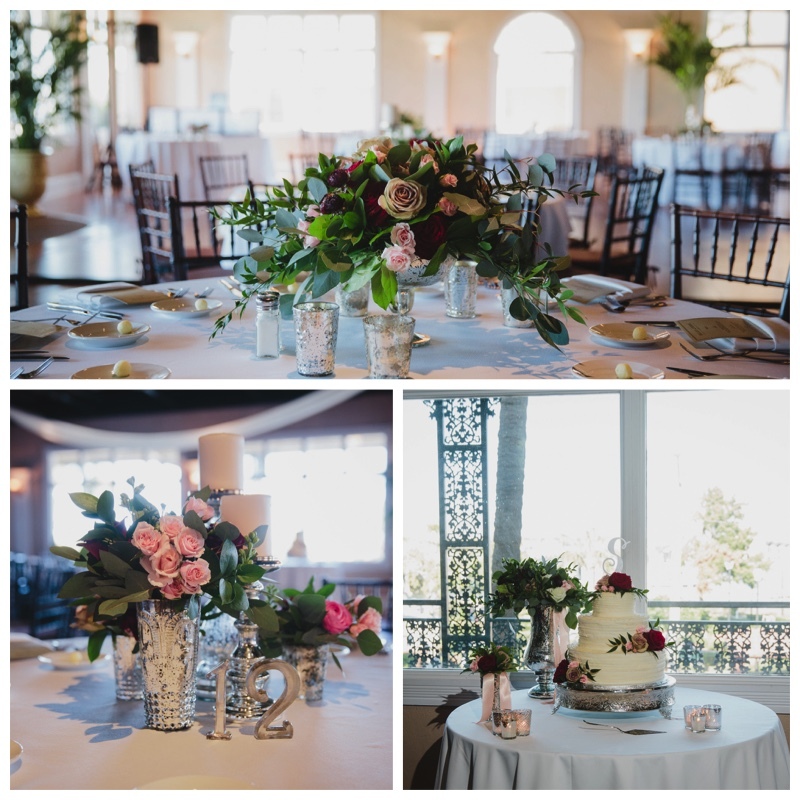 The vases were accented with greenery and white roses. 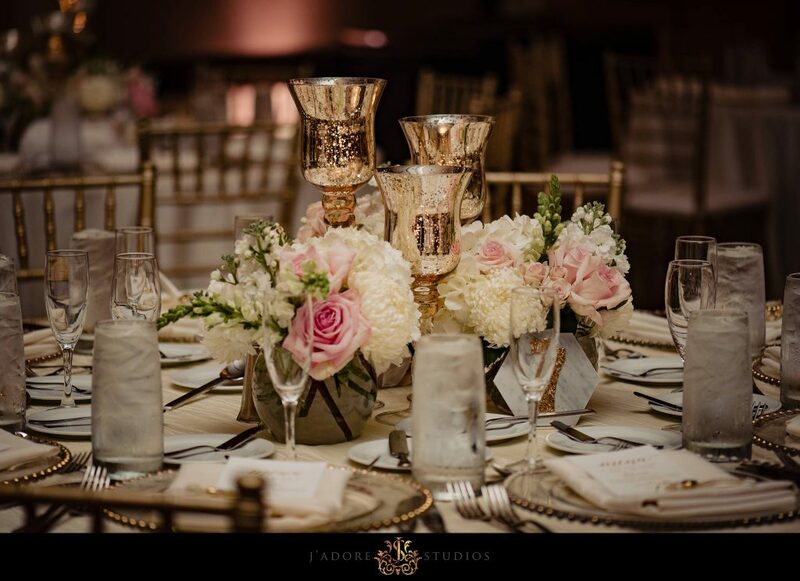 The head table had silver mercury vases with the bouquets placed in them. 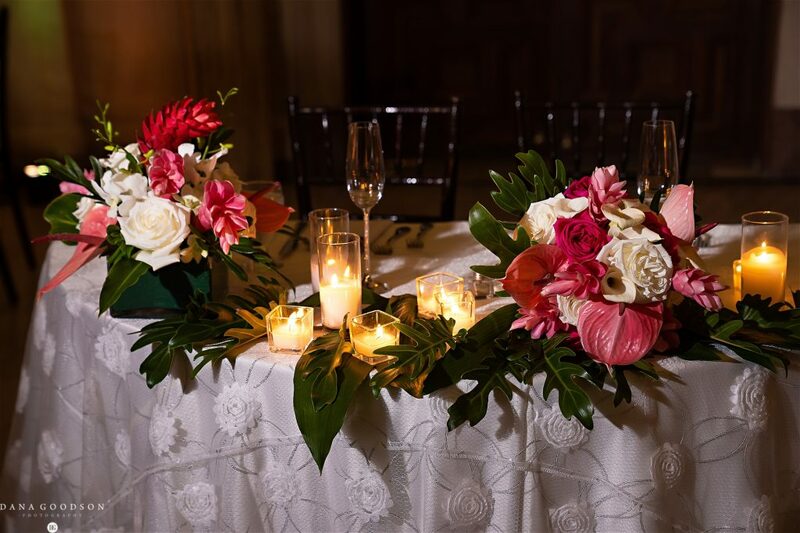 Greenery and candles were placed between the vases. 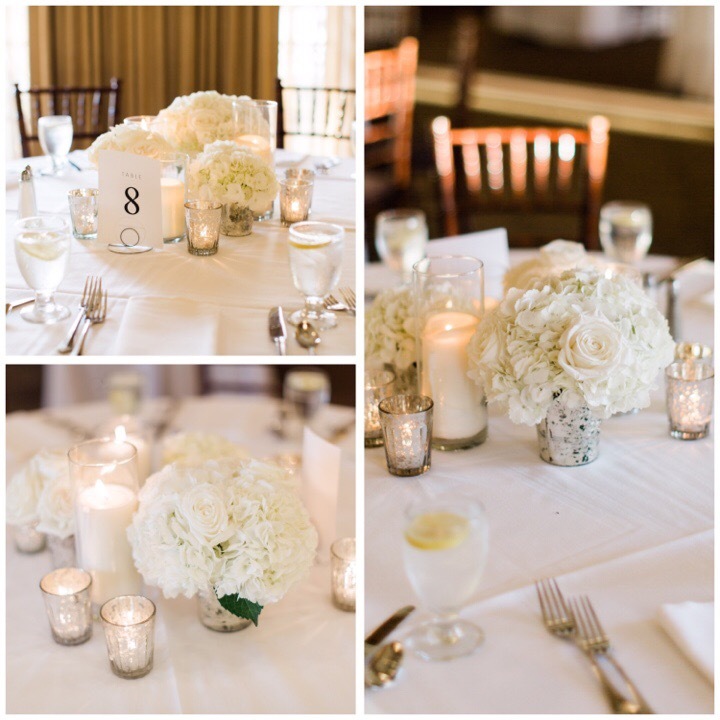 Centerpieces of candles and complimenting white flowers. 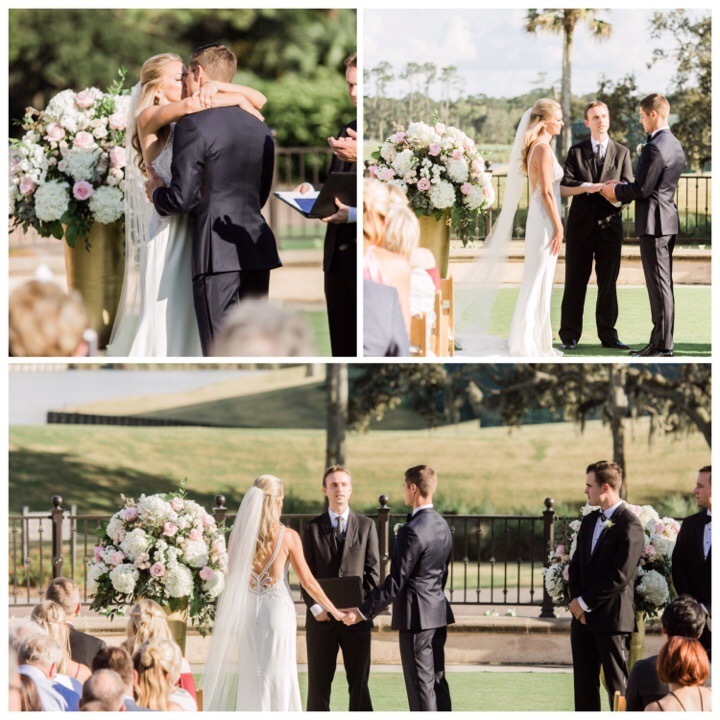 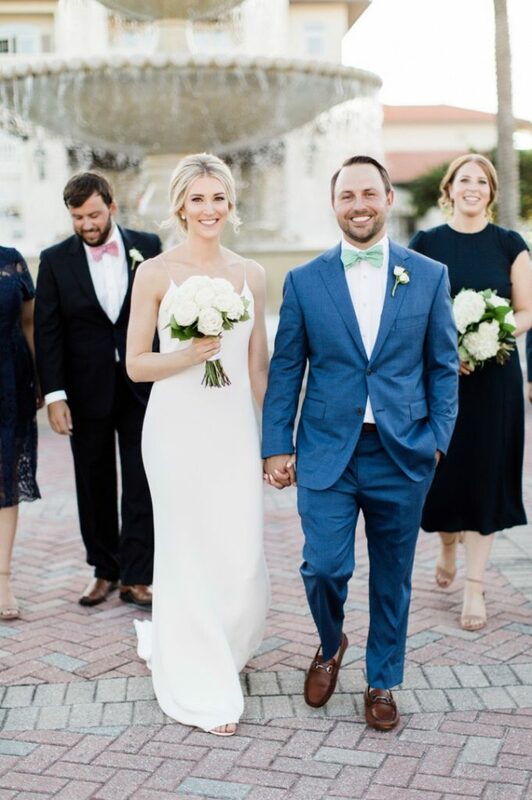 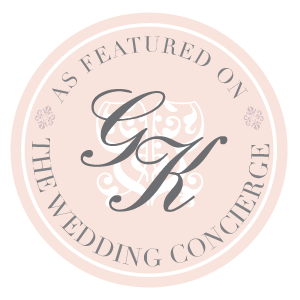 Kyle and Elizabeth had a stunning wedding and reception at TPC Sawgrass. 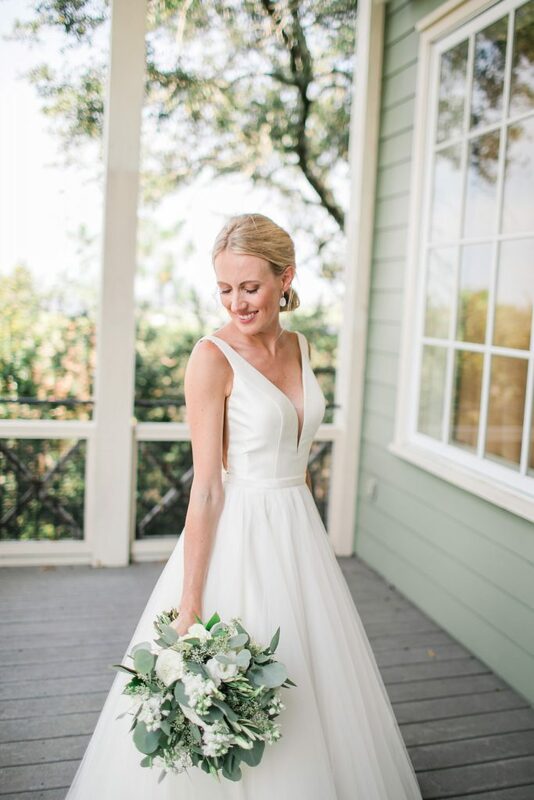 We loved the soft, timeless look of Elizabeth’s style. 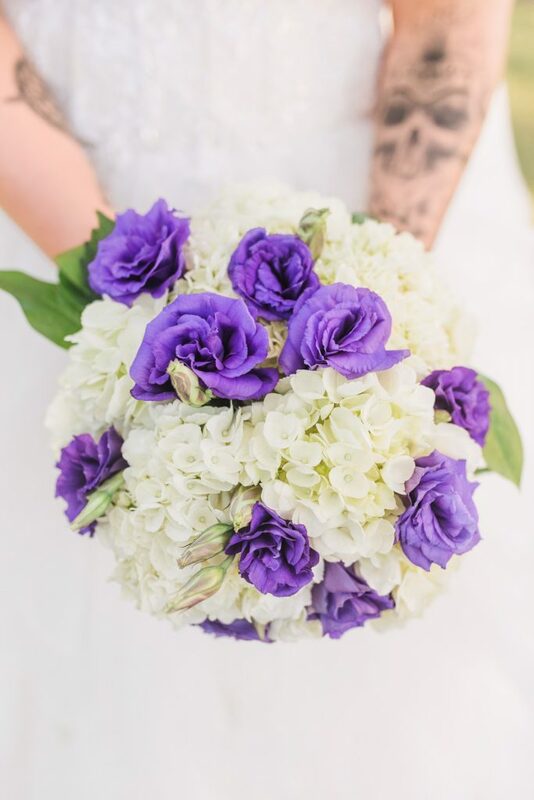 Elizabeth carried an absolutely gorgeous textured bouquet. 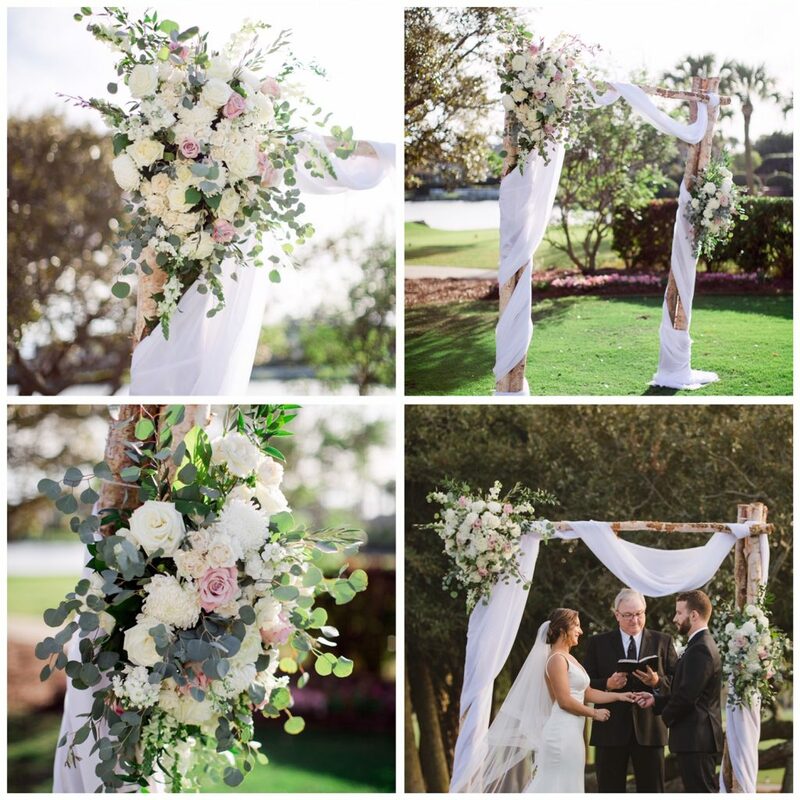 It was created using white and blush flowers with eucalyptus and ruscus. 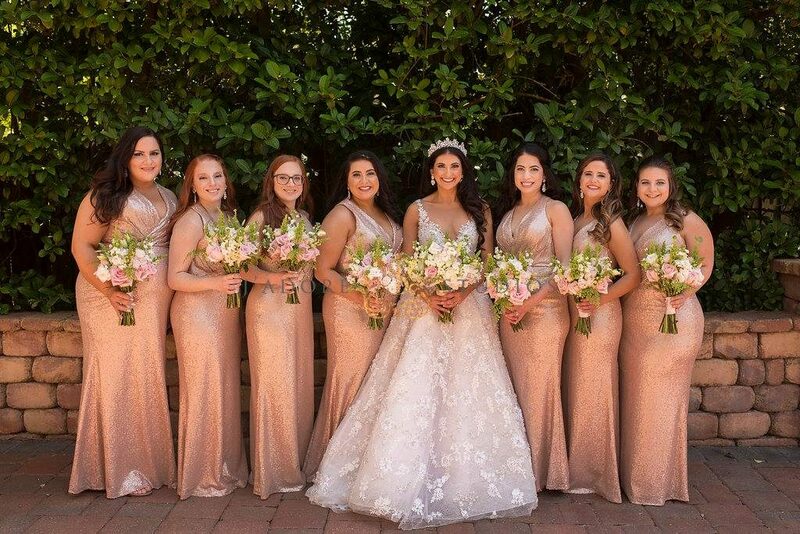 The bridesmaids carried smaller versions of Elizabeth’s bouquet. 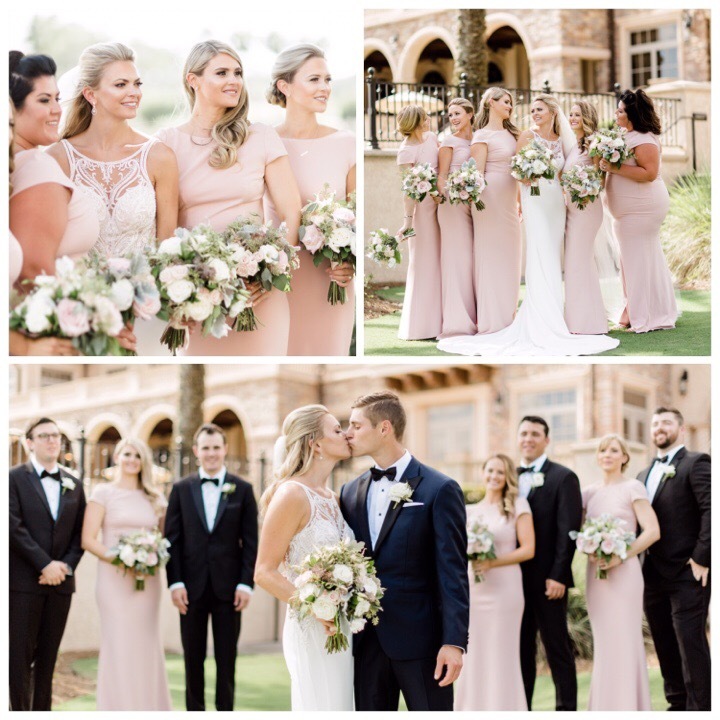 Their bouquets had more blush and pink to compliment their dusty rose gowns. 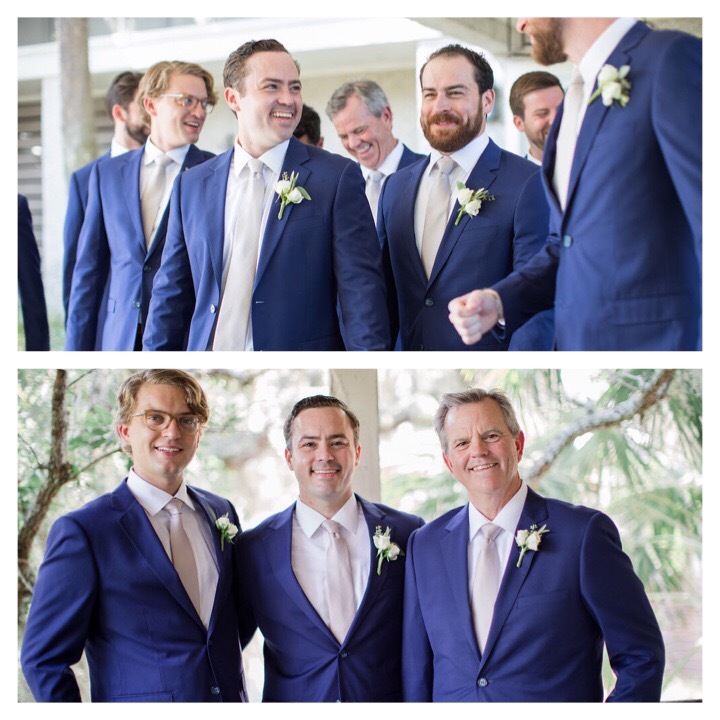 Kyle and groomsmen wore classic boutonnières. 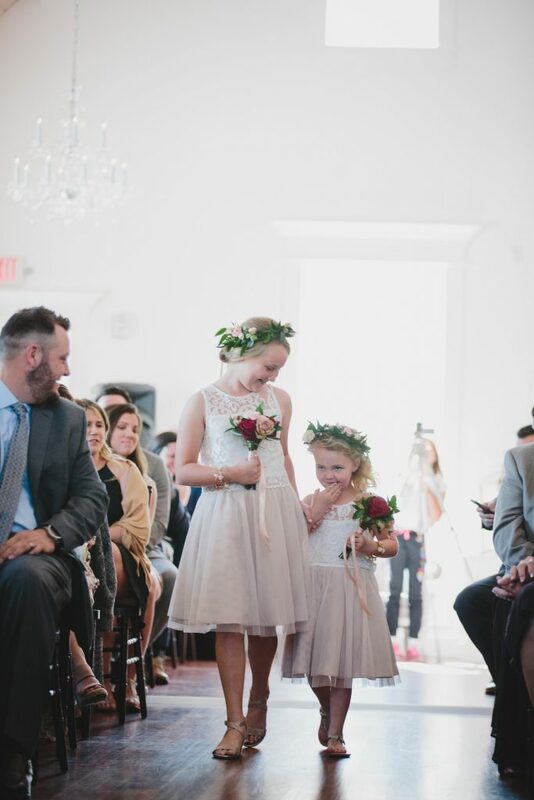 Elizabeth walked down an aisle lined with blush and white rose petals. 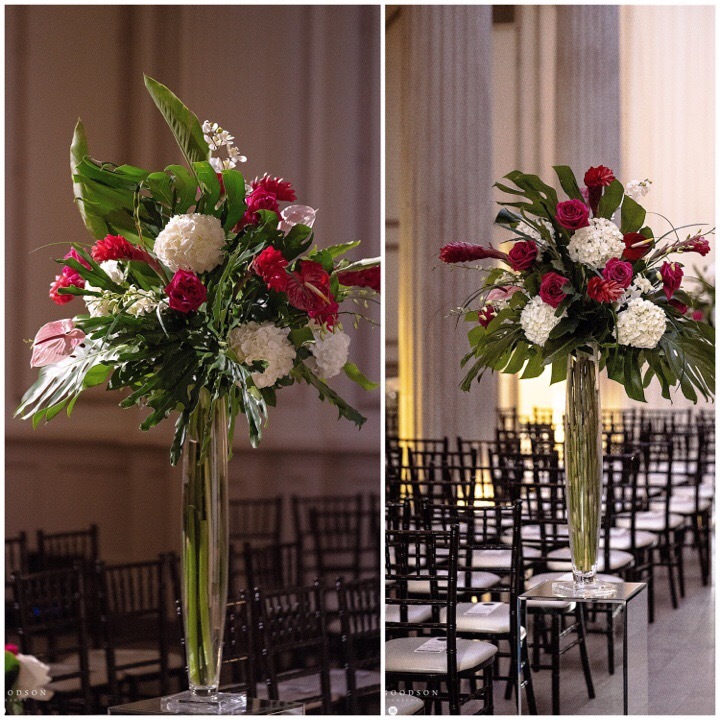 The bride and groom were married between two lush, stunning altar arrangements. 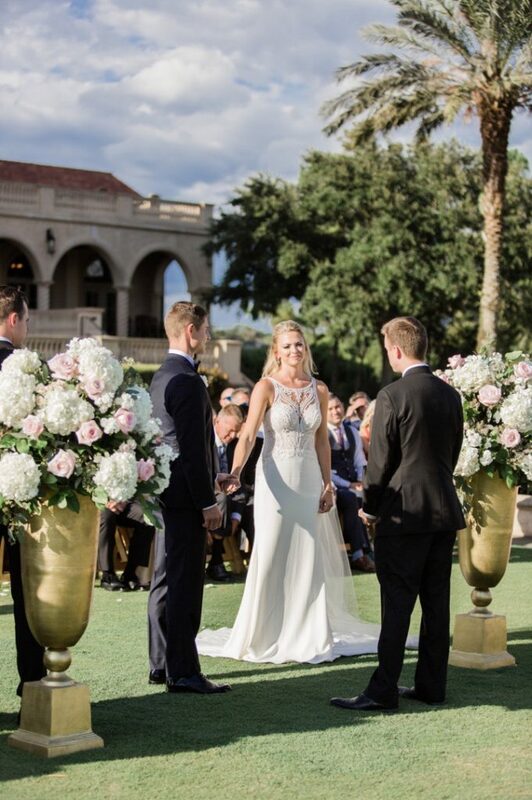 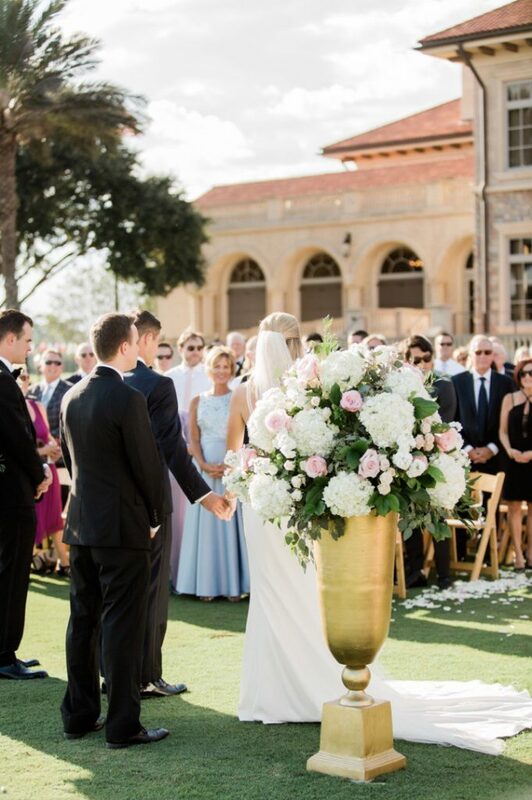 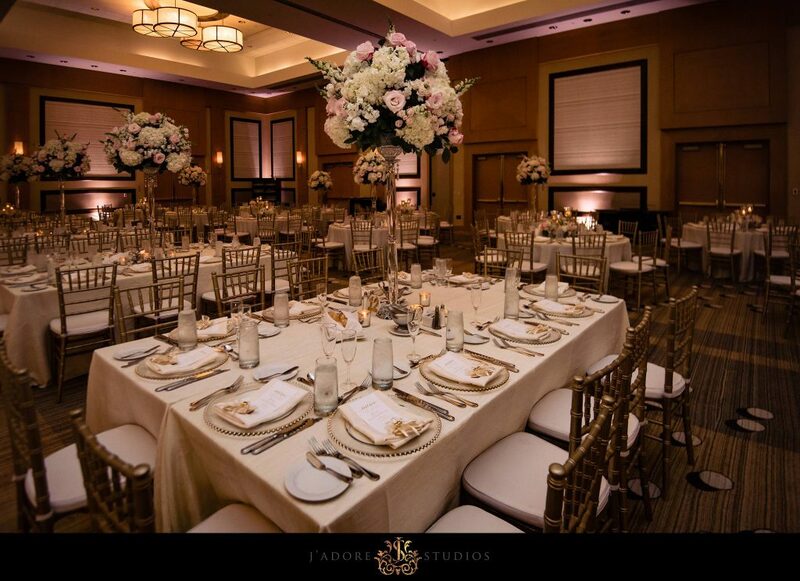 The arrangements were created in gold urns with white and light pink flowers and cascading greenery. 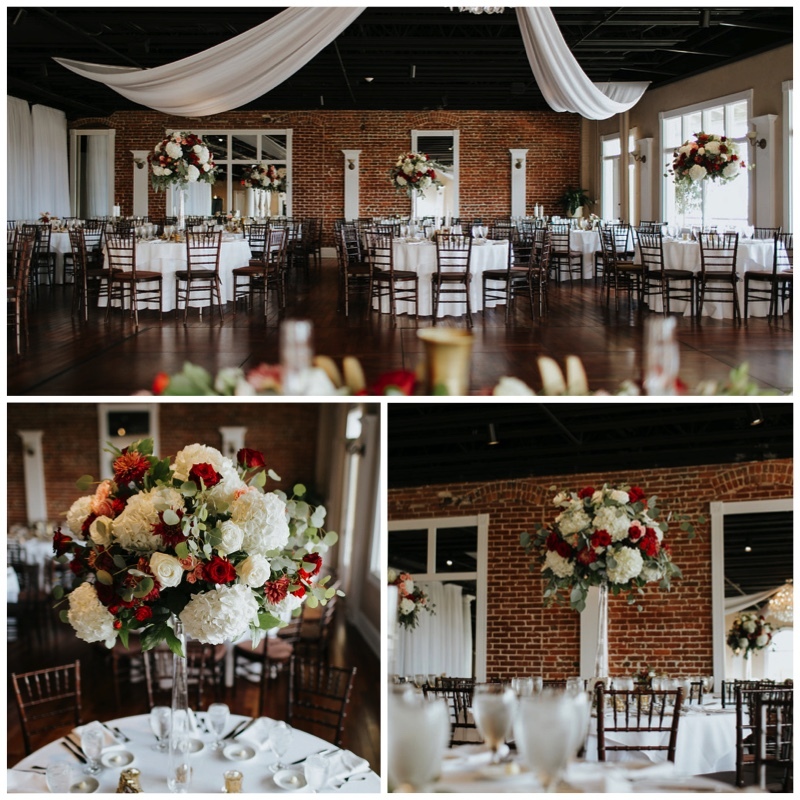 These beautiful arrangements were also used in their reception. 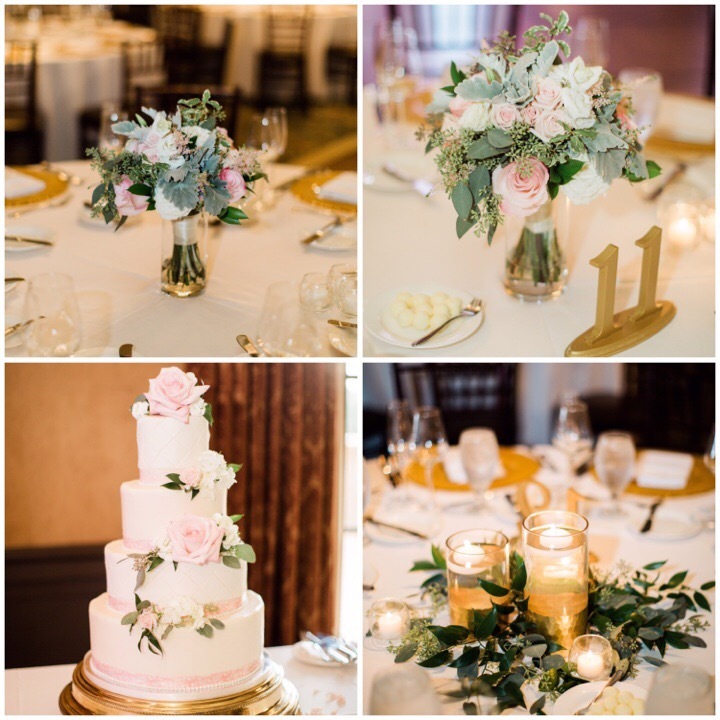 Kyle and Elizabeth’s reception was romantic and classic. 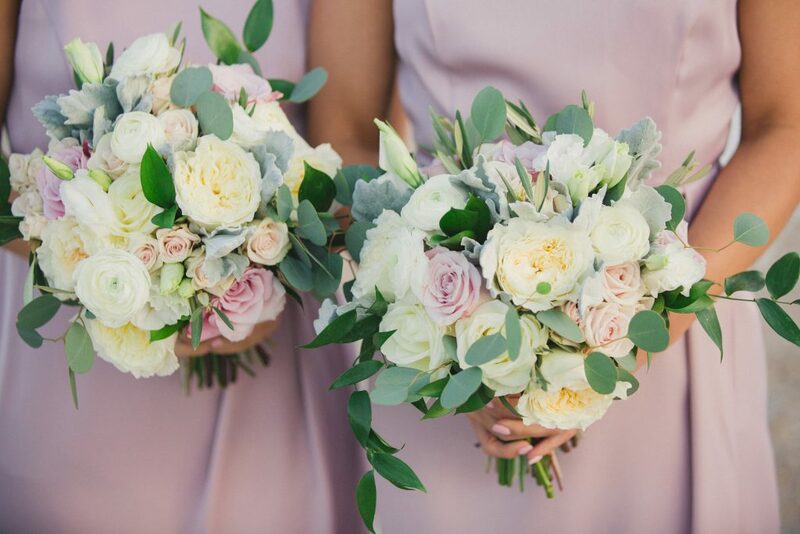 We loved the soft pinks and white with greenery. 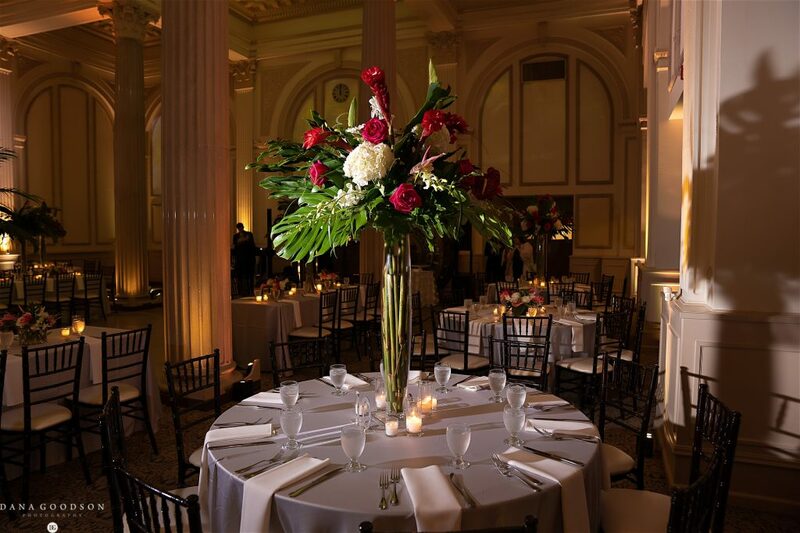 She had a variety of centerpieces including tall, short, and composite centerpieces. 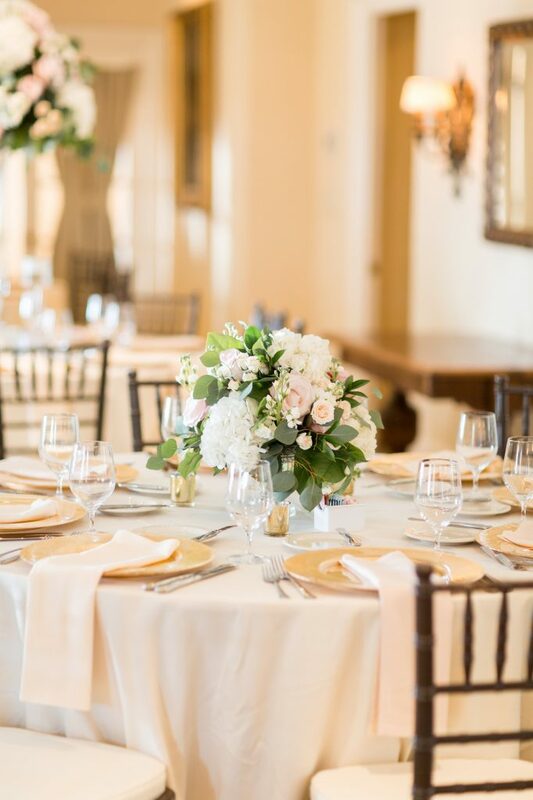 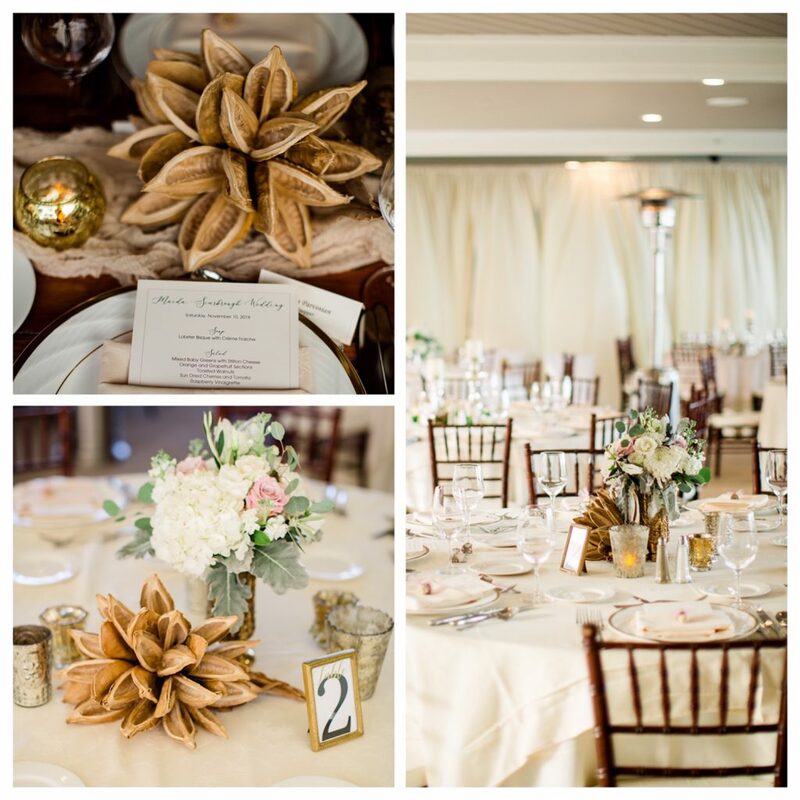 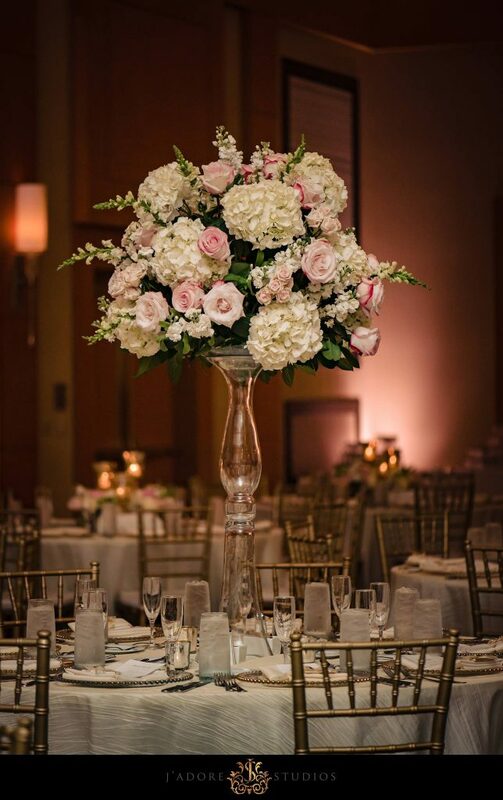 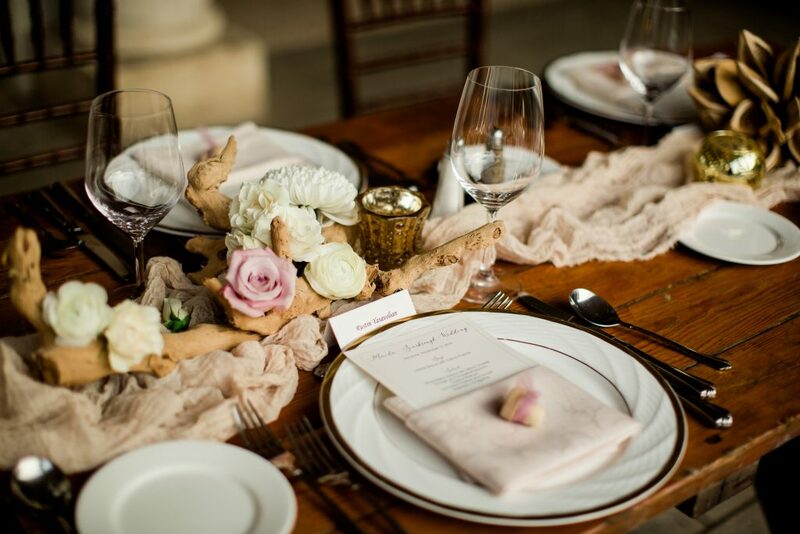 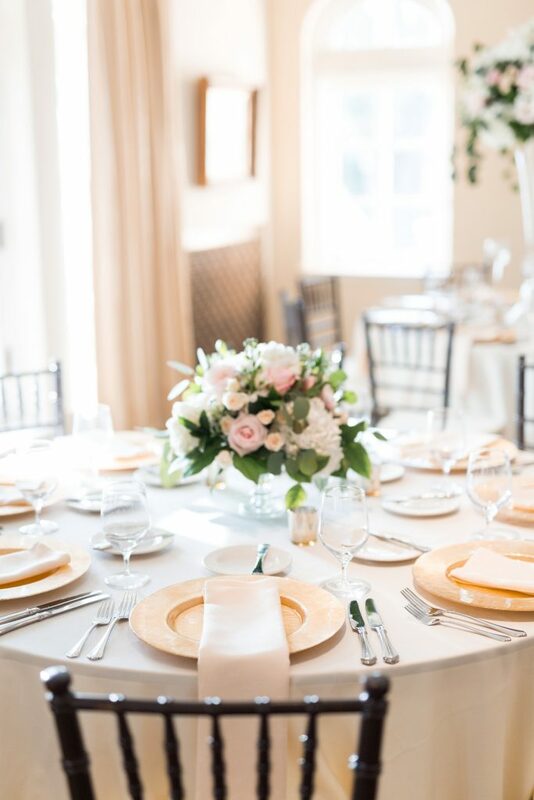 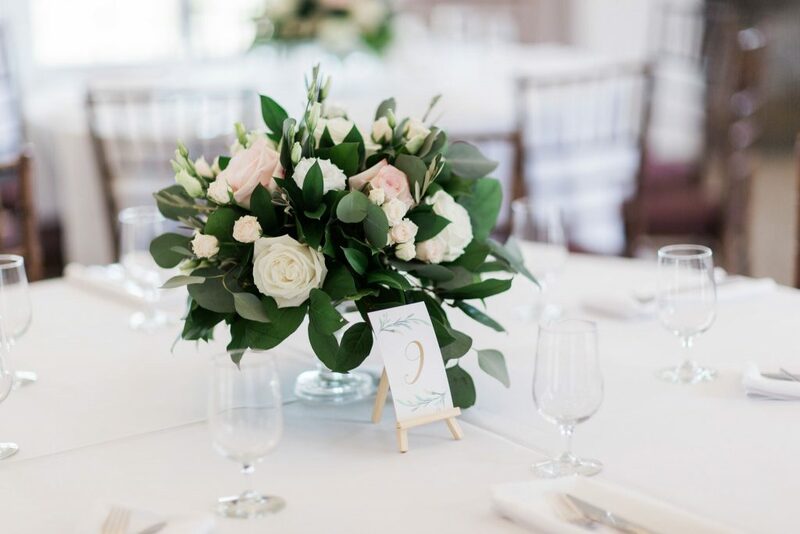 Textured Centerpieces created with complimenting white and blush flowers in glass stands. 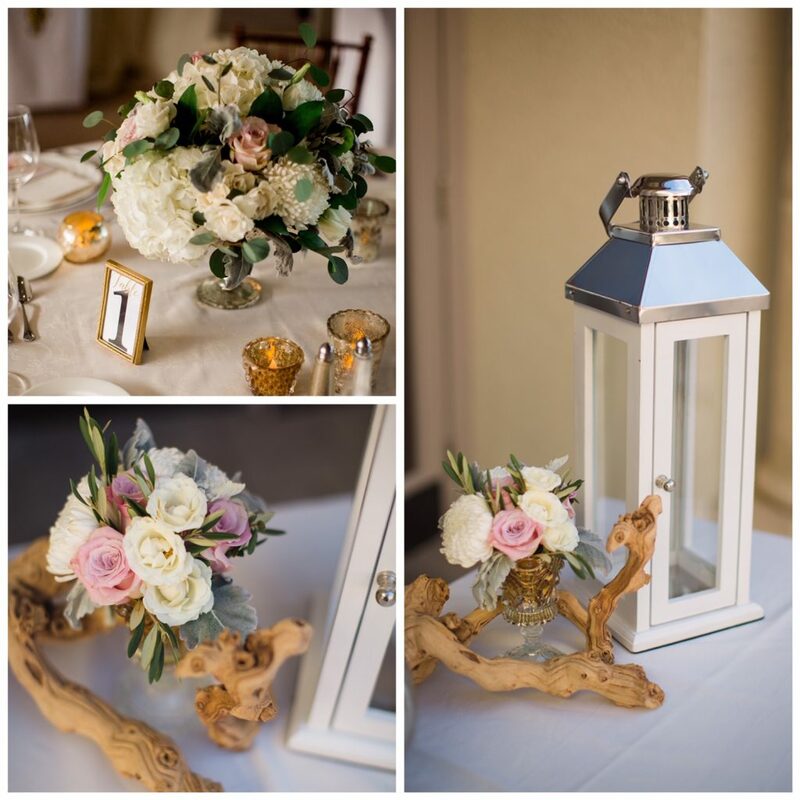 Gorgeous centerpieces created using the bridesmaids bouquets. 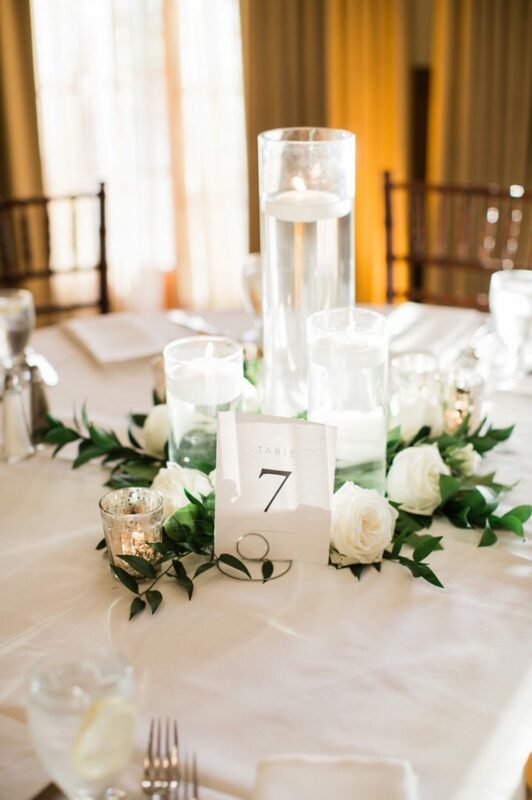 The composite centerpieces were made with greenery and floating candles. 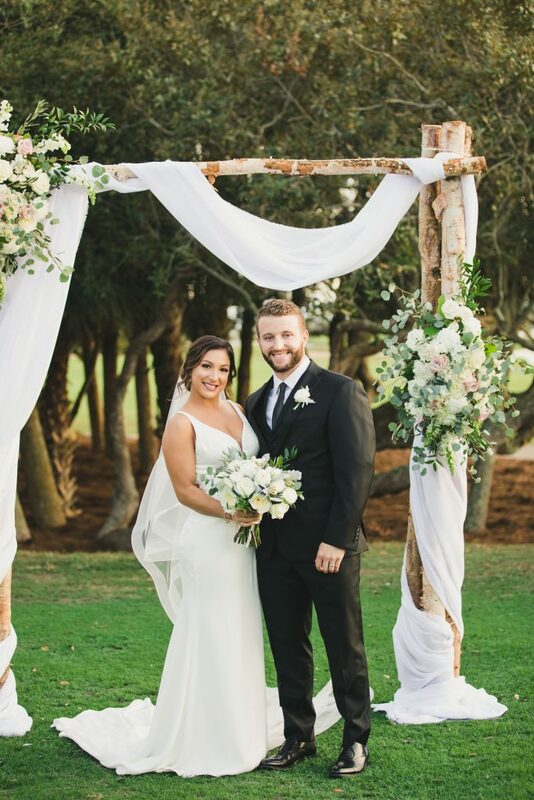 Mariah and Brad had the perfect tropical wedding and reception at The Treasury. 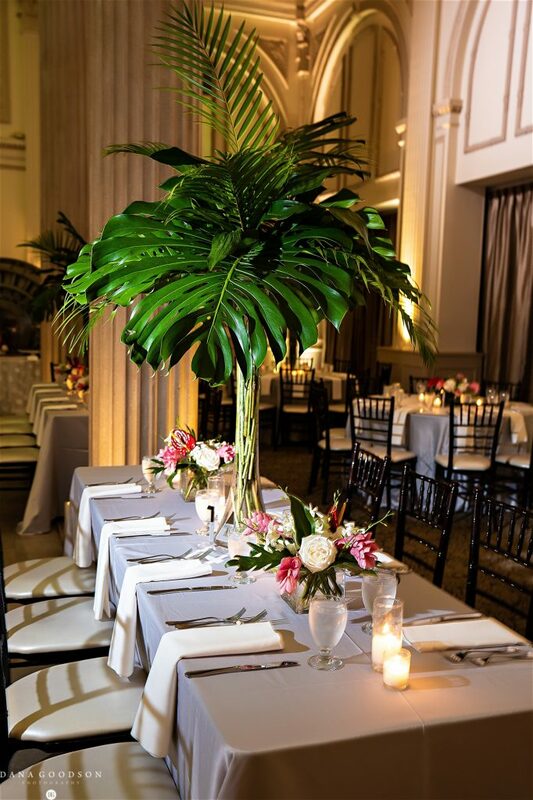 The use of orchids and tropical leaves made this a stunning reception and wedding. 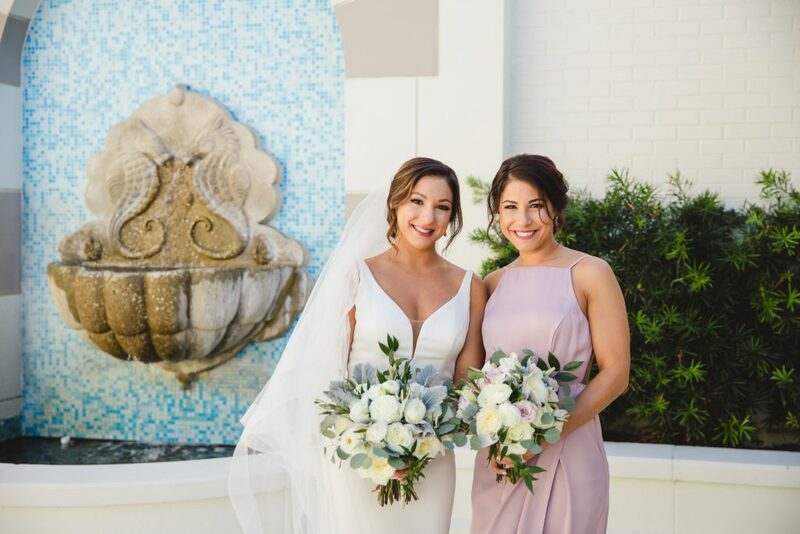 The tropical hot pinks only added to the beauty. 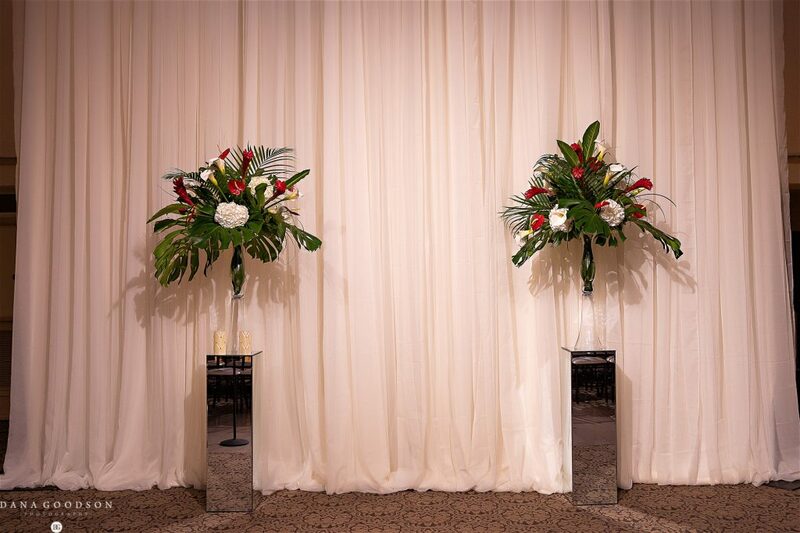 Mirrored columns and tall glass vases added a modern touch to this tropical oasis. 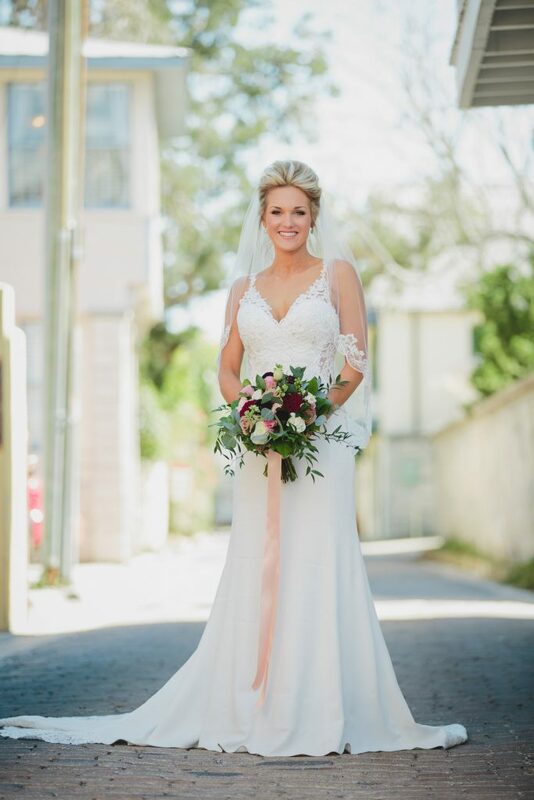 Mariah was a stunning bride and absolute joy to work with. 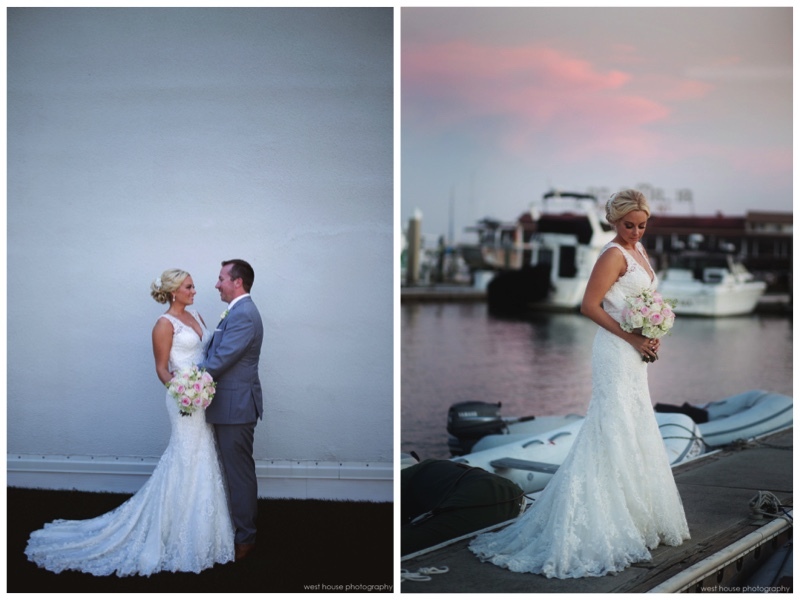 Rachel and Kyle had a beautiful outside ceremony at Oyster Bay Yacht club. 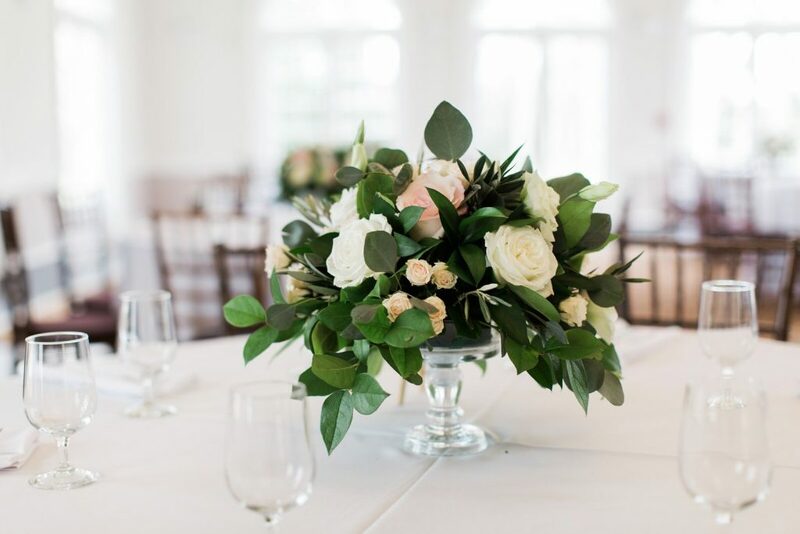 We loved Rachel’s organic floral vision. 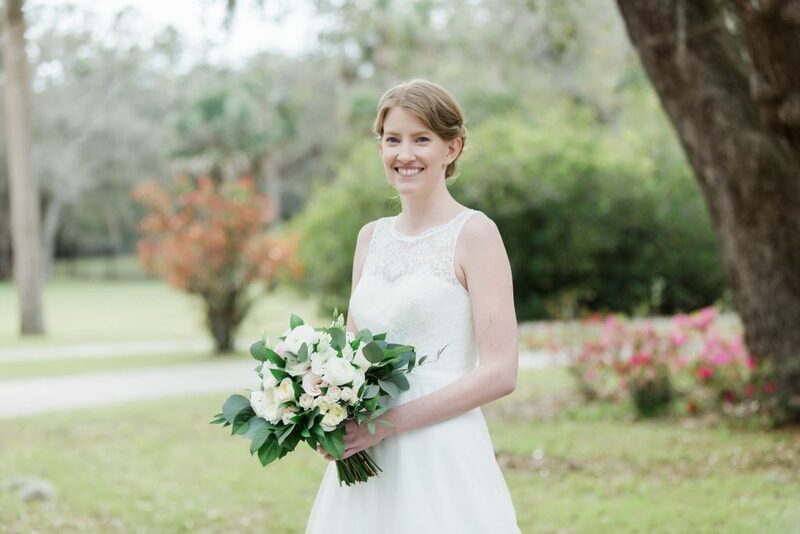 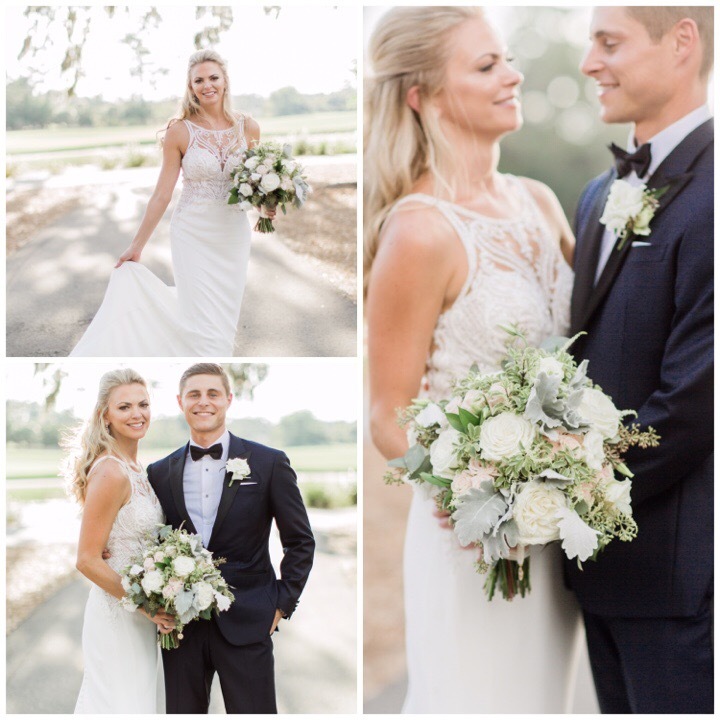 Rachel carried a gorgeous, organic bouquet of greenery with touches of white flowers. 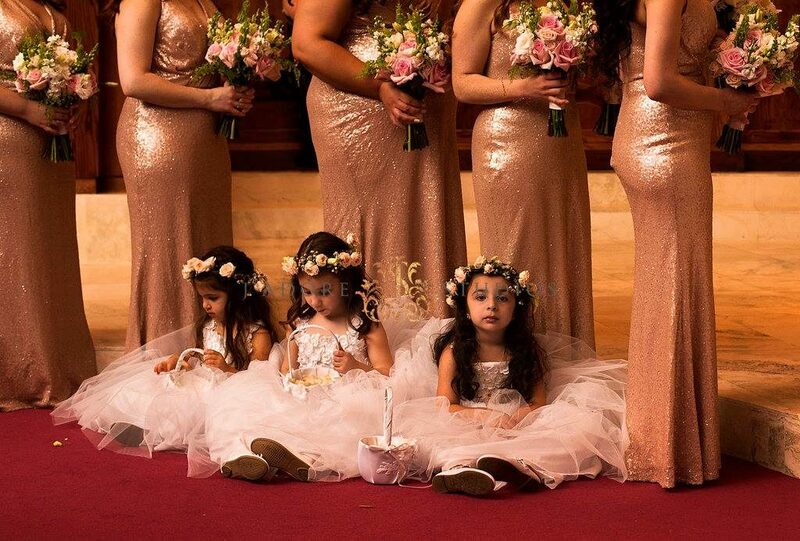 Rachel’s girls carried smaller versions of her bouquet. 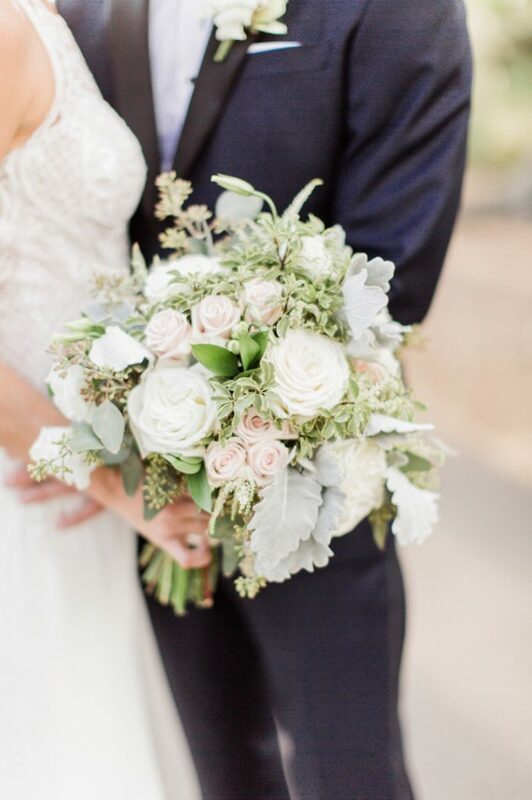 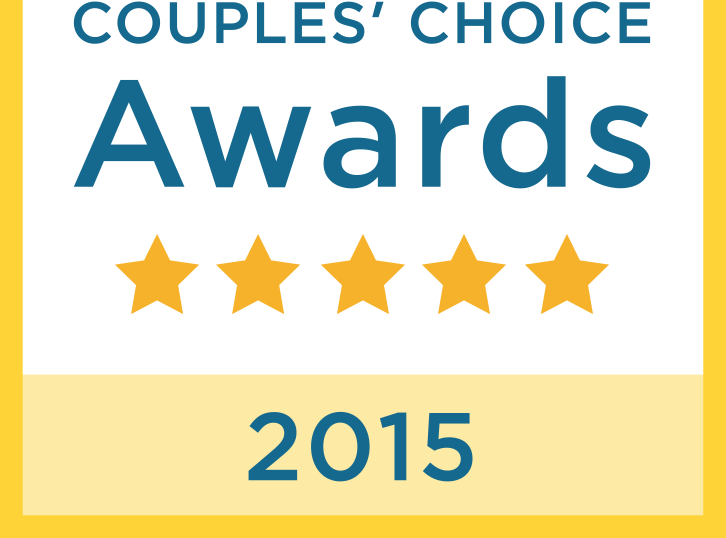 We love the natural organic look of the bouquets with their gowns. 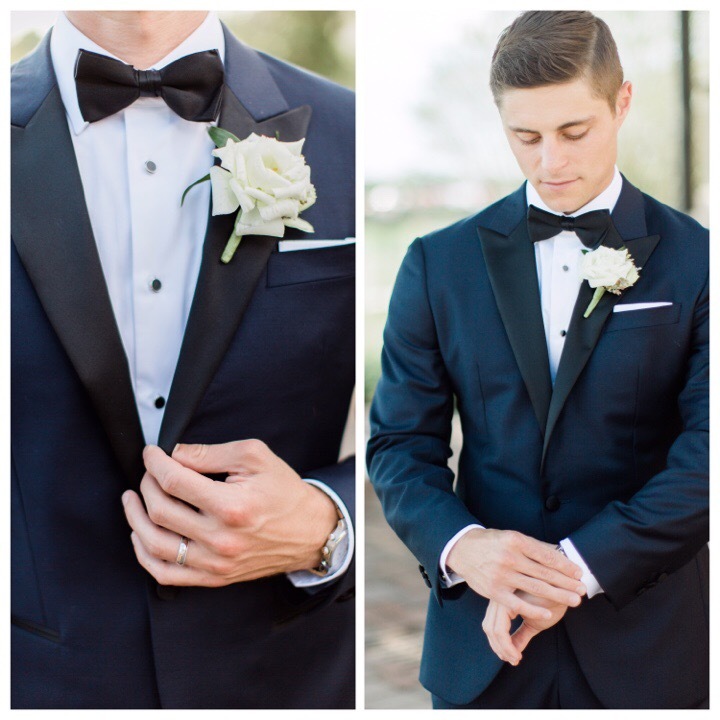 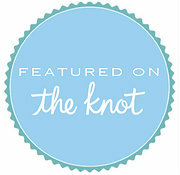 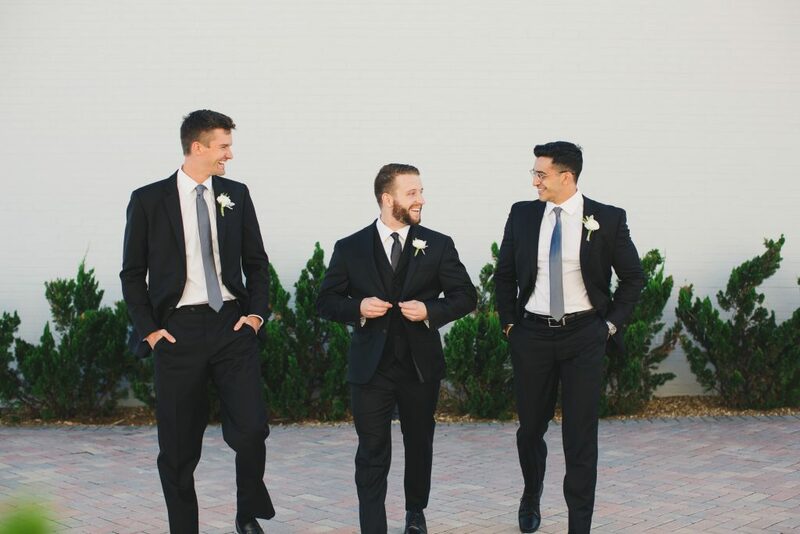 Kyle and his groomsmen wore boutonnières of white spray roses, eucalyptus, and olive branch. 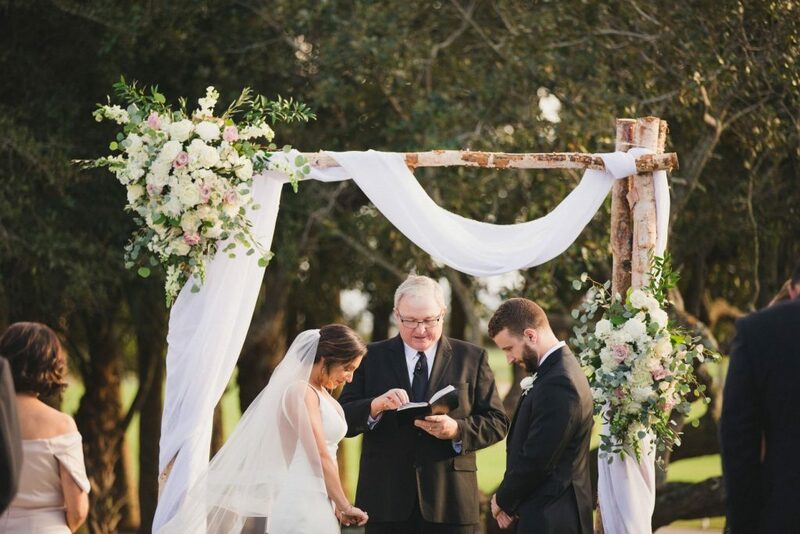 Kyle and Rachel became husband and wife under a beautiful arbor. 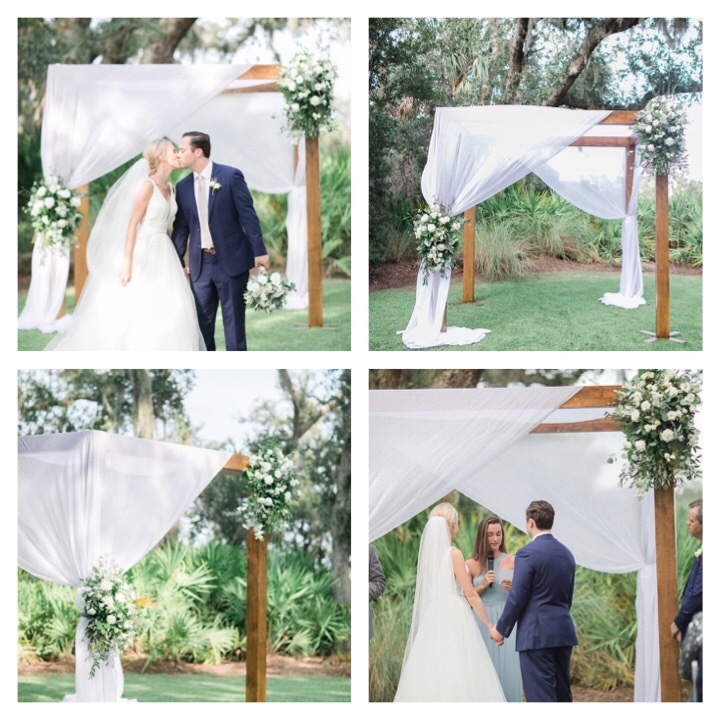 The arbor was draped with fabric and had two sprays of flowers. 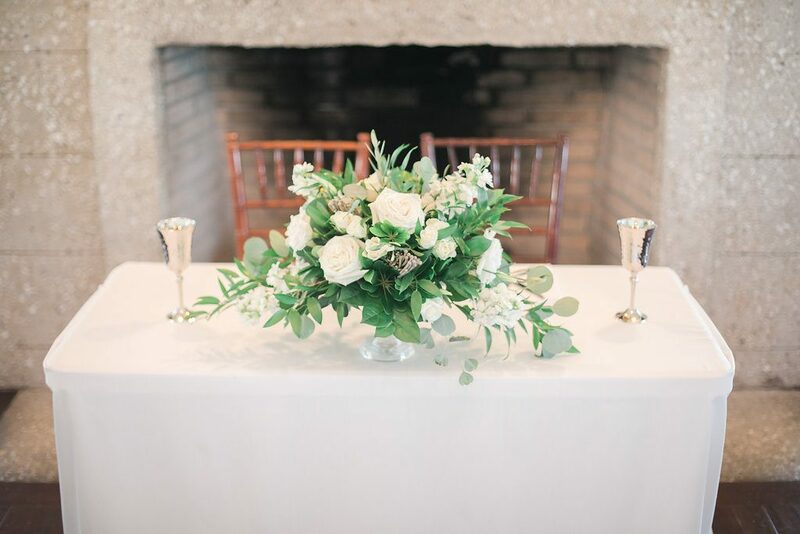 The sprays were made of greenery and white flowers. 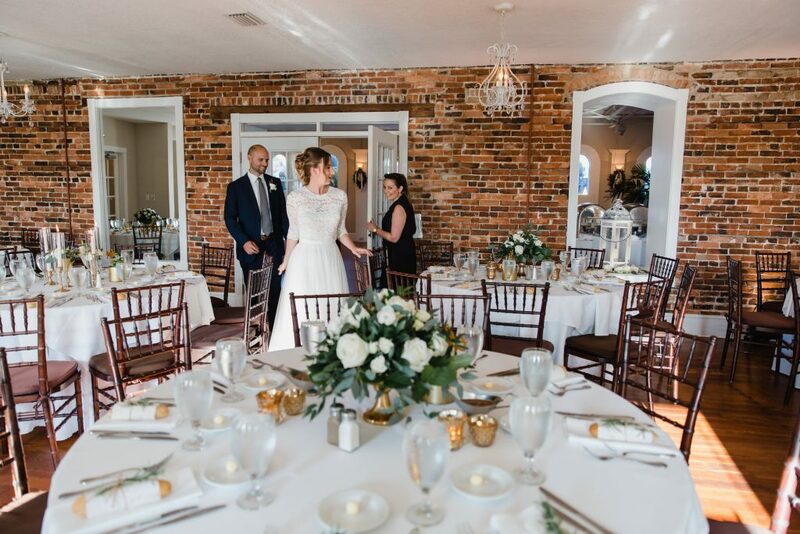 Rachel and Kyle’s reception was full of romance. 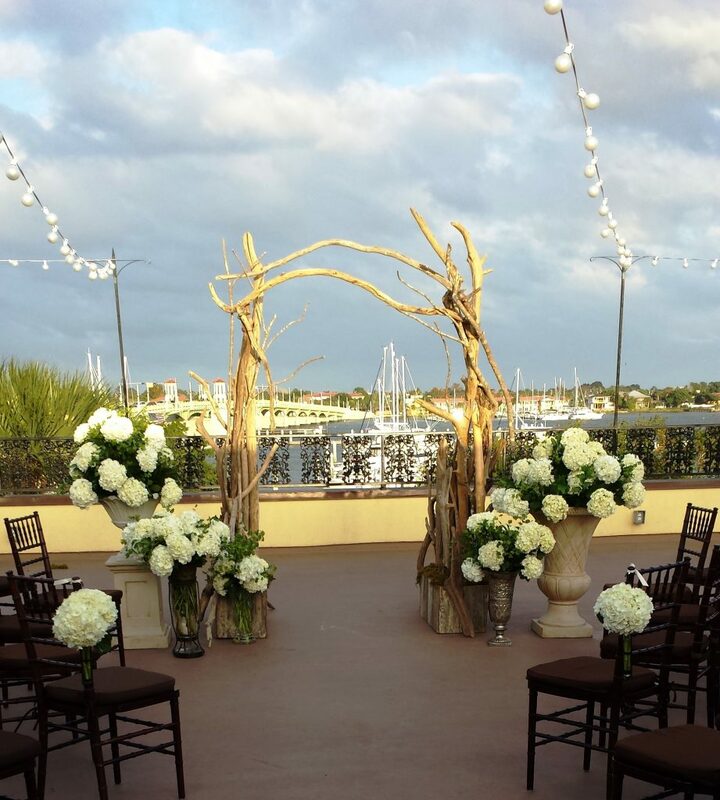 They had centerpiece created with a mix of greenery and white flowers. 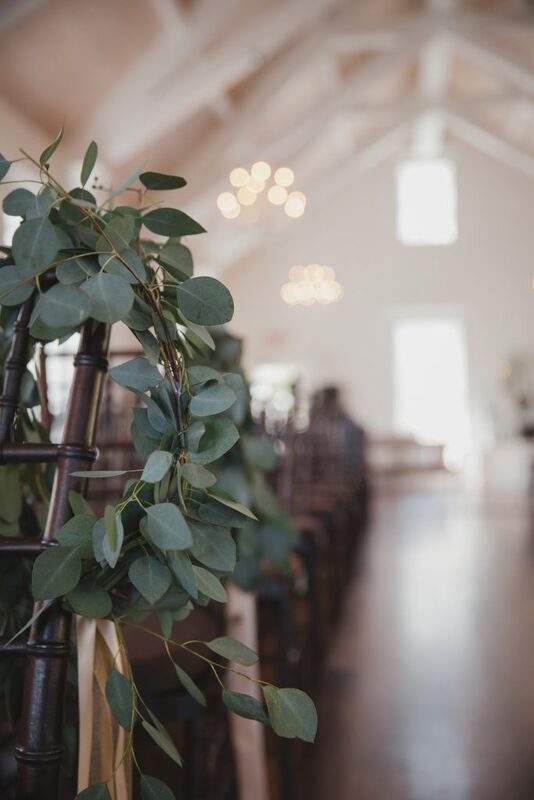 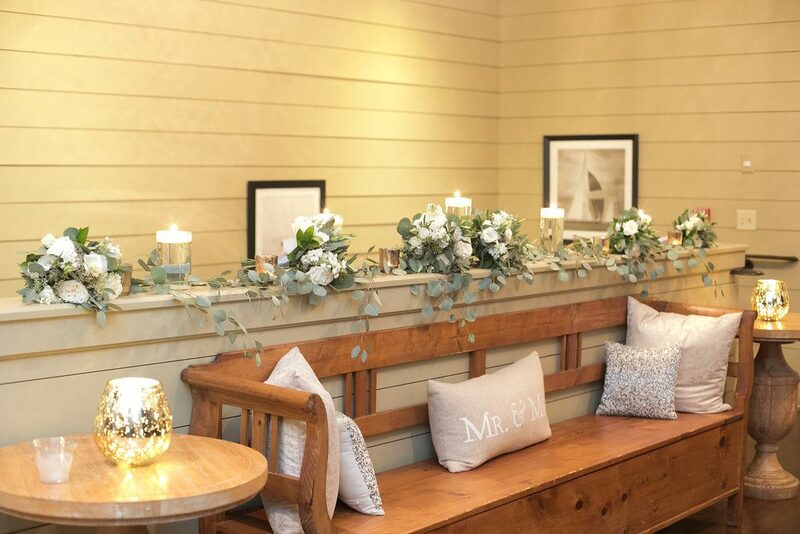 We loved the simple elegance of this organic reception. 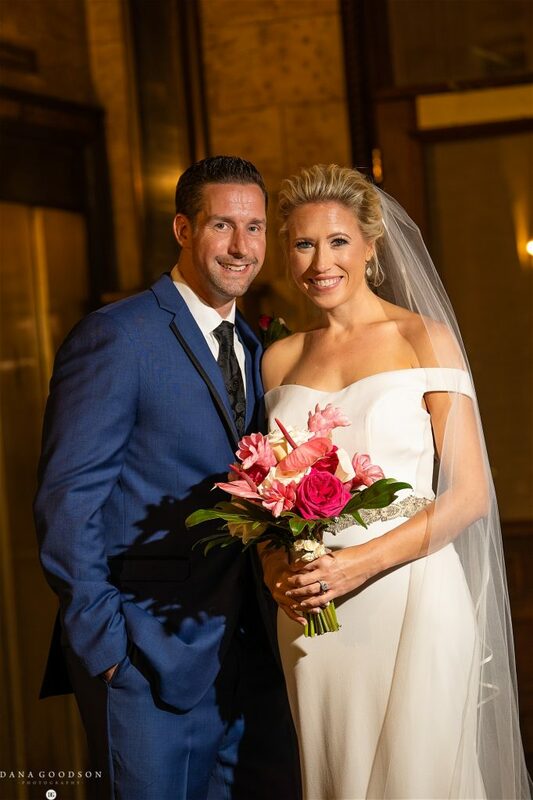 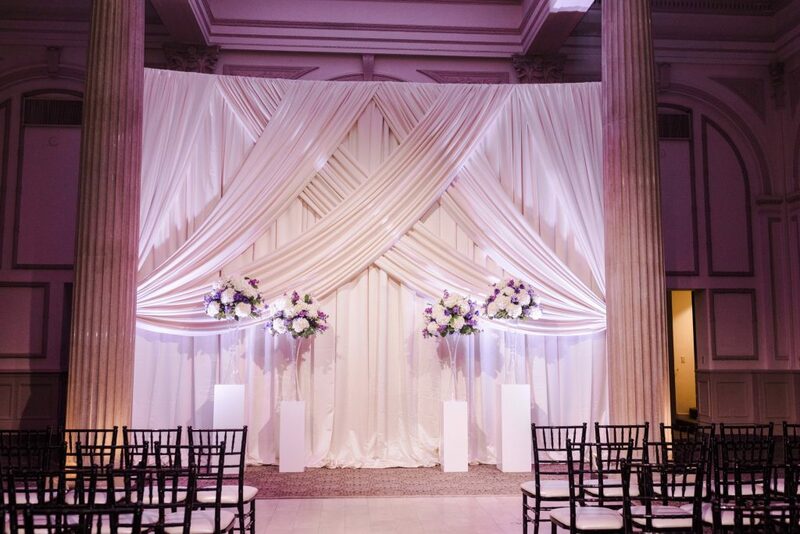 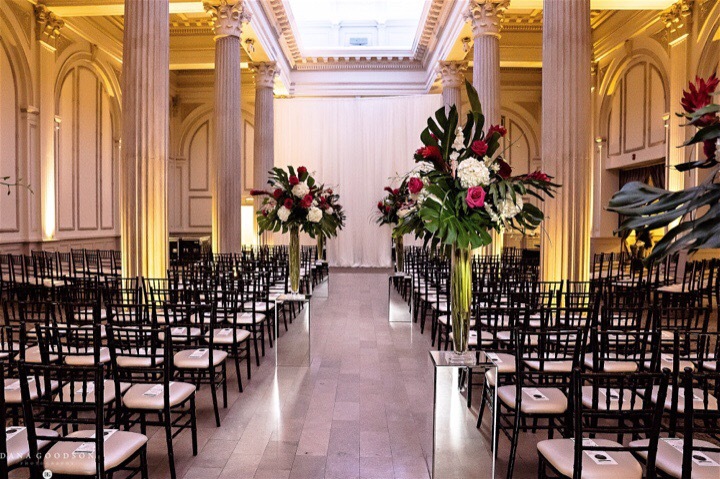 Liz and Mark were married in a glamorous ceremony at the Treasury on the Plaza. 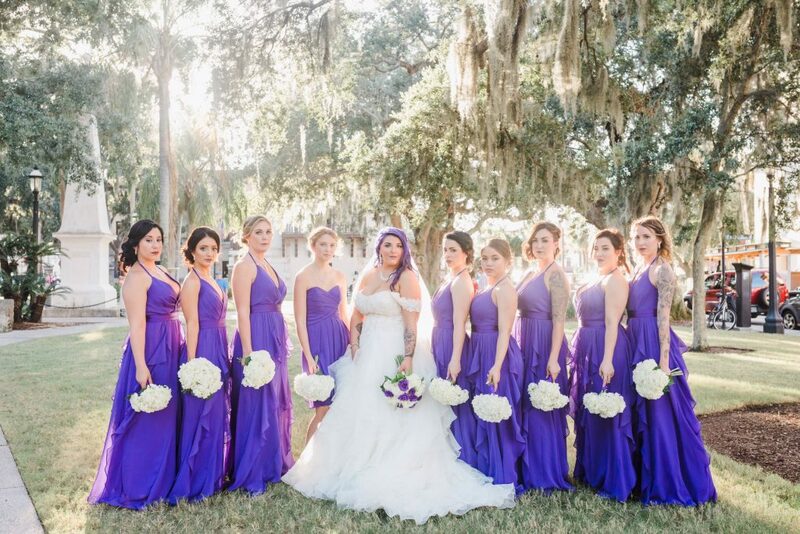 Her glitzy personality showed in her stunning white, silver, and purple color palette. 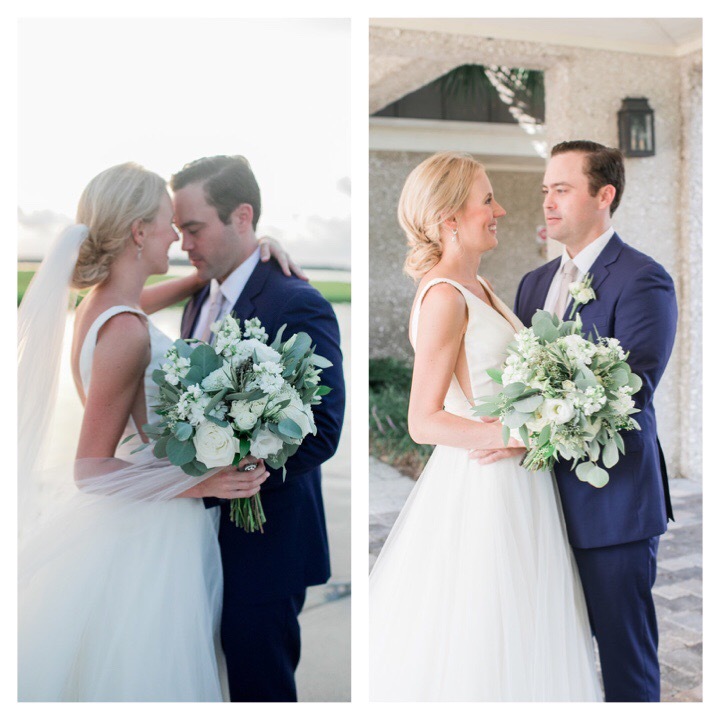 We loved working with Liz and creating her chic floral vision. 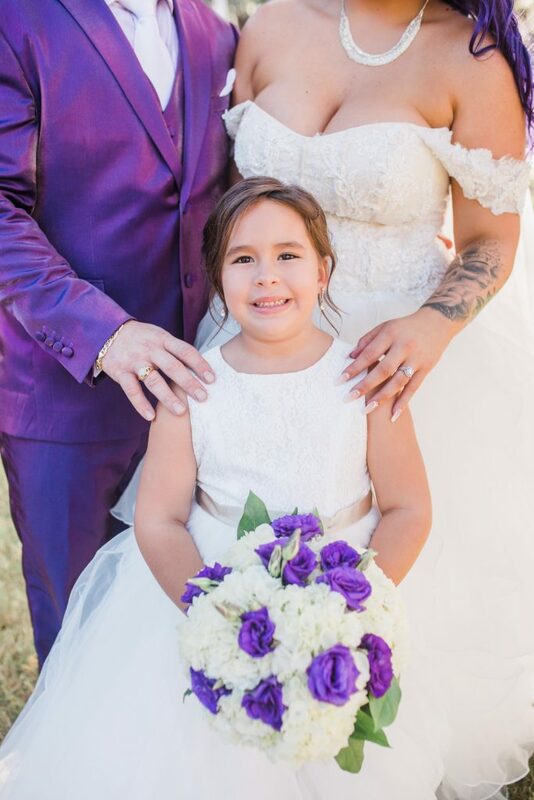 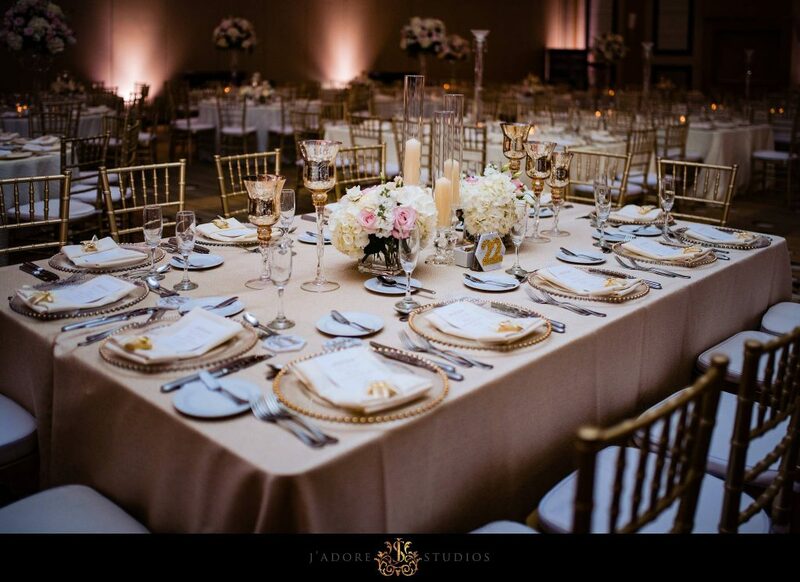 Laura and Romey had the most stunning wedding and reception. 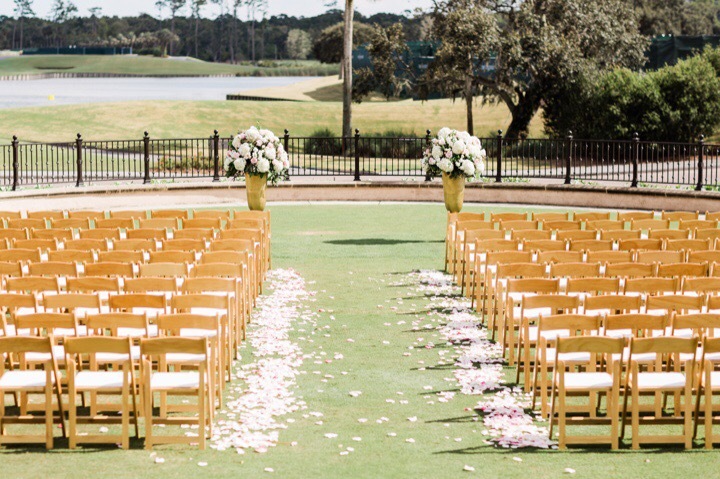 We loved the white and blush with accents of gold. 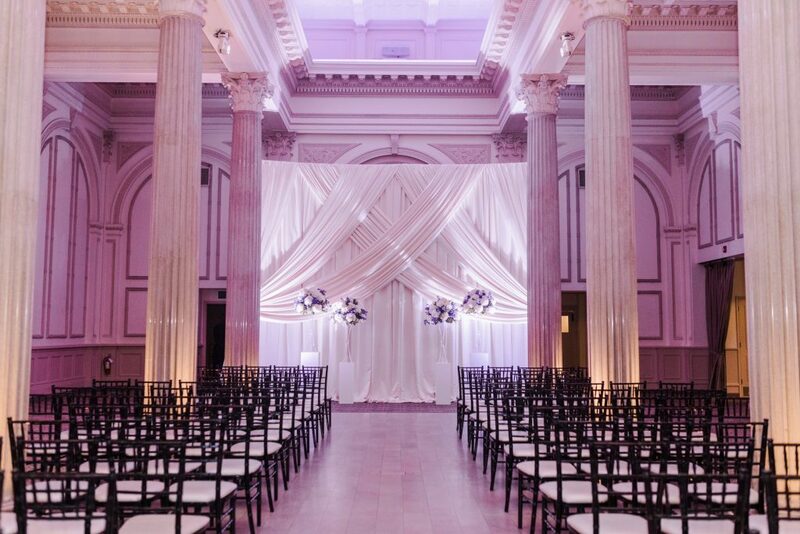 Enjoy these beautiful pictures of their romantic reception. 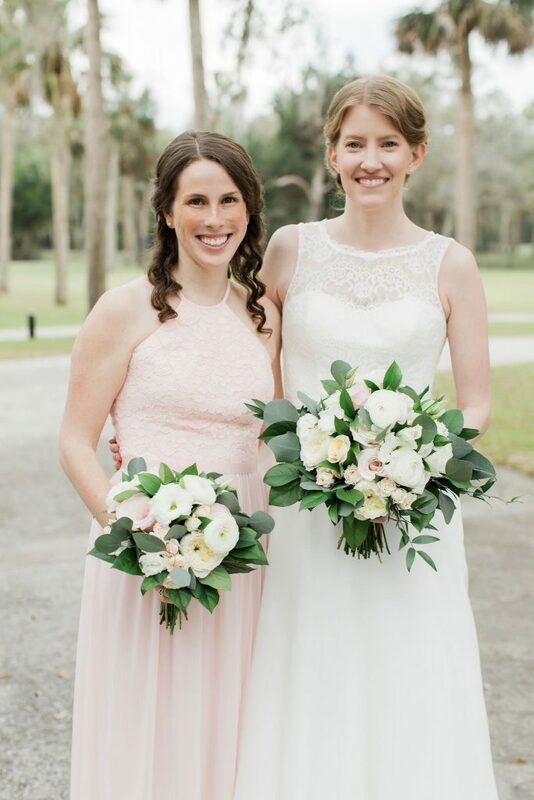 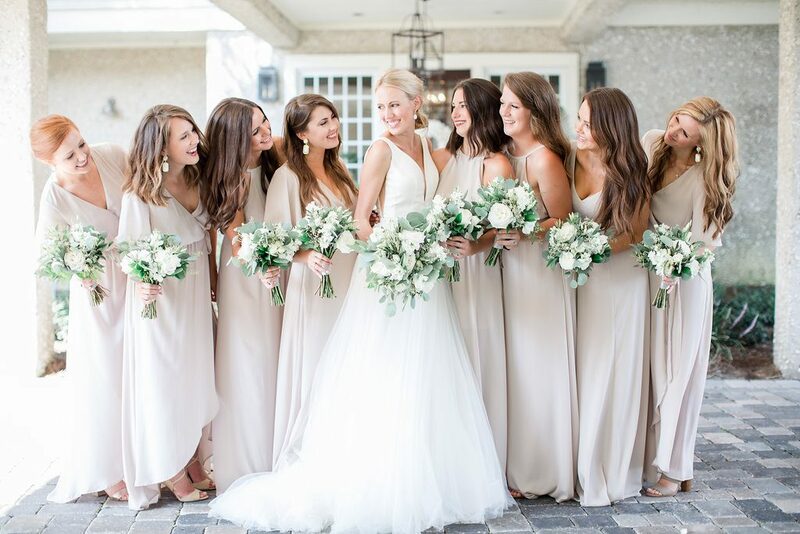 Laura and her bridesmaids carried bouquets of white and blush flowers that included roses, snapdragons, stock, spray roses, and bells of Ireland. 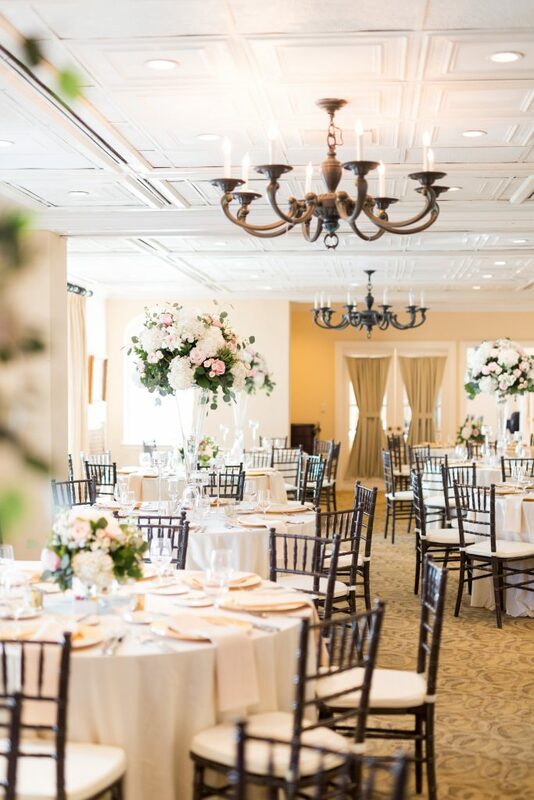 This reception was full of romance and beauty. 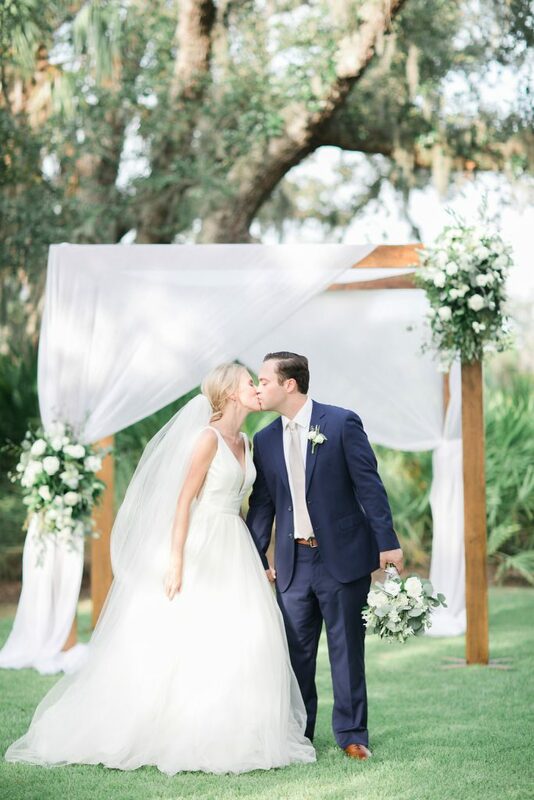 Ashley and Ari had a romantic outside wedding followed by a beautifully classic reception at the Ribault Club. 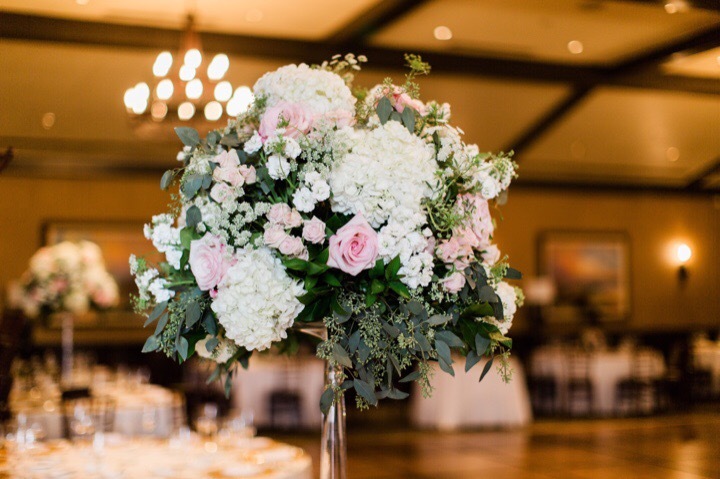 Blush and white flowers with foliage made an absolutely stunning color palette for this wedding. 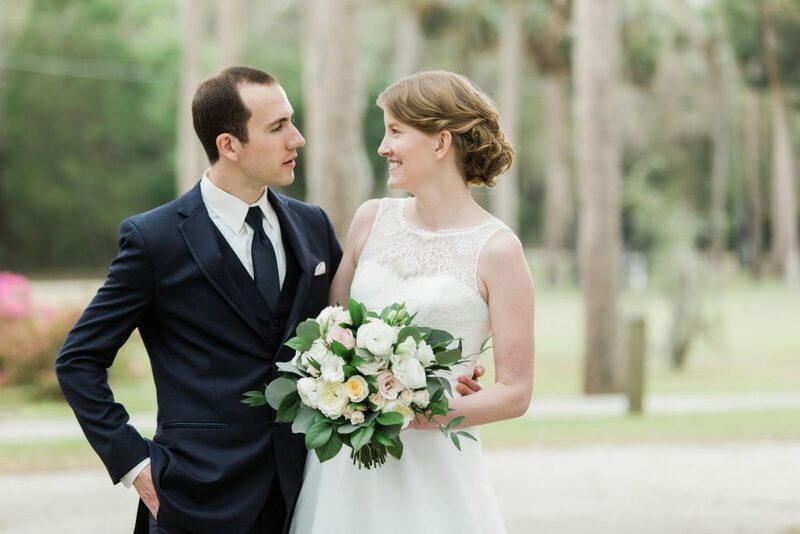 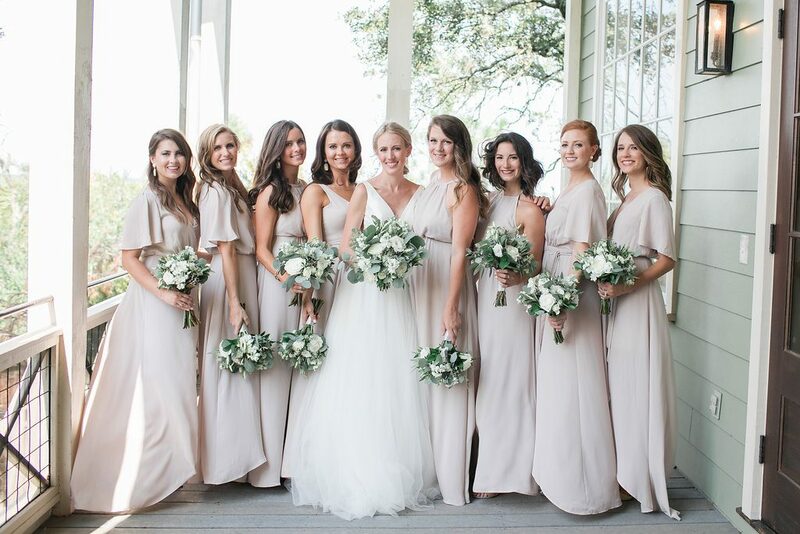 We loved this simple yet stunning wedding. 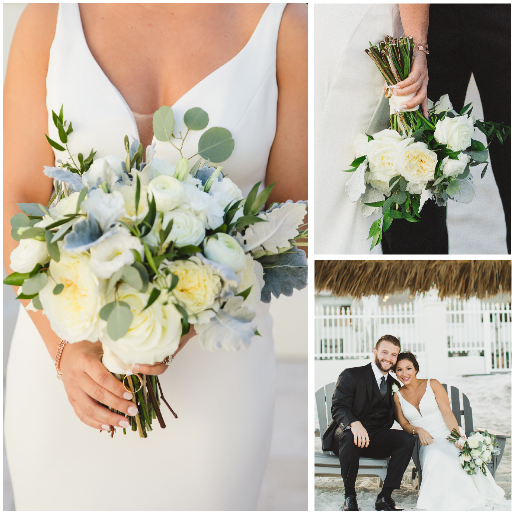 An organic bouquet created with foliage and white ivory and blush flowers made a gorgeous bridal bouquet. 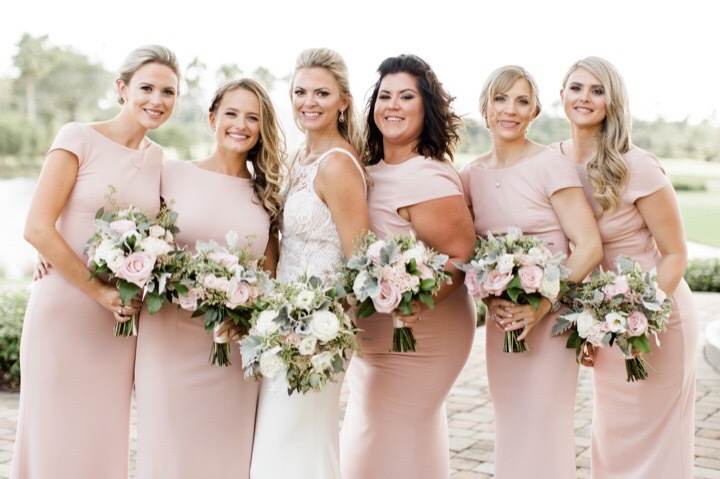 Ashley’s bridesmaids carried that smaller versions of her bouquet. 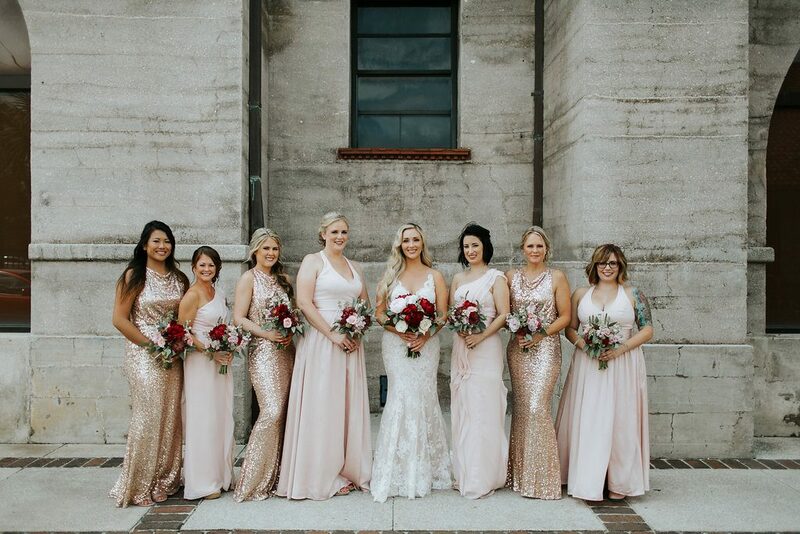 The bouquets were the perfect complement to their light pink gowns. 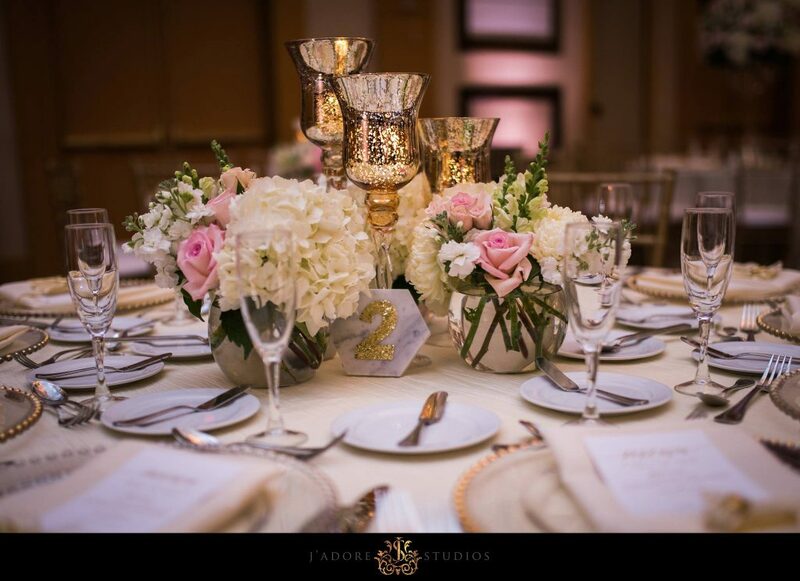 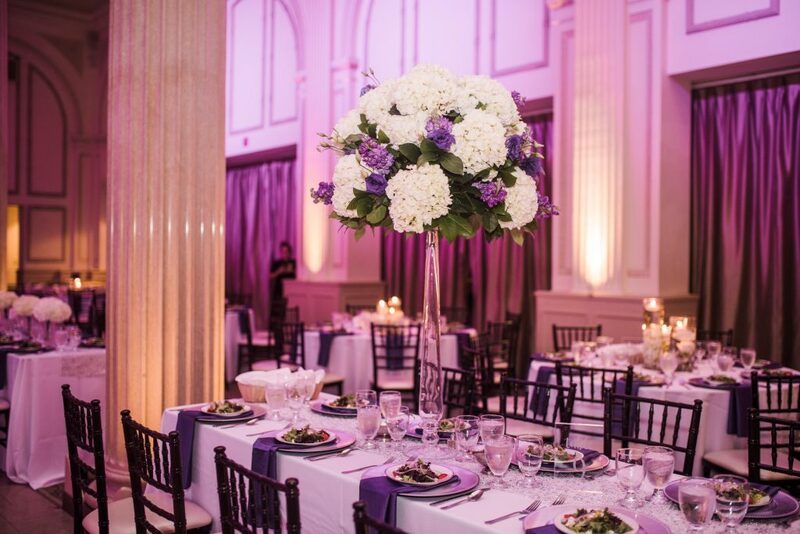 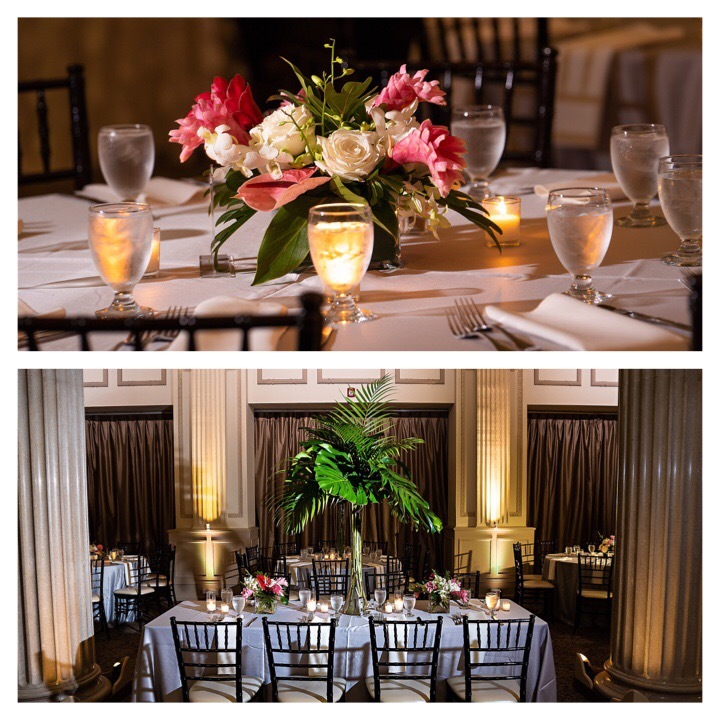 Centerpieces were created on glass pedestals. 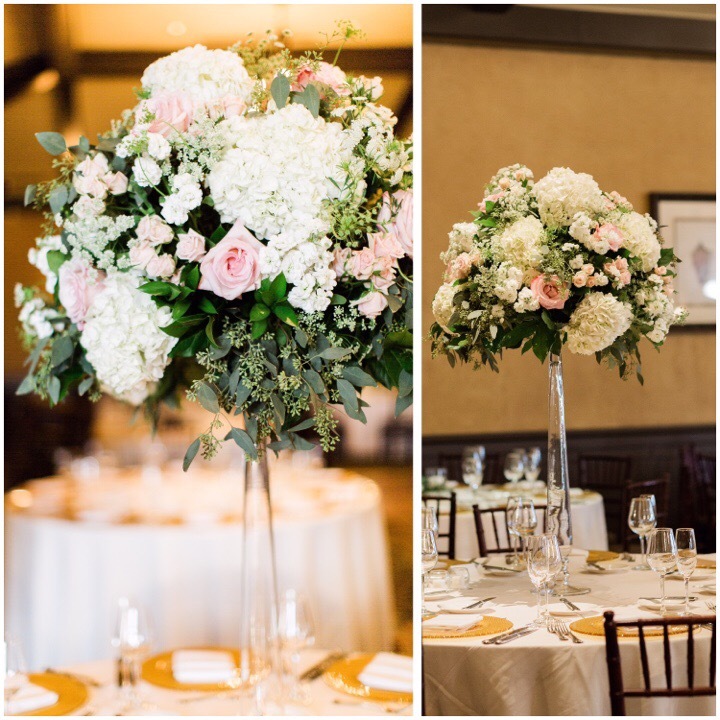 They were made of mixed greenery with blush ivory and white flowers. 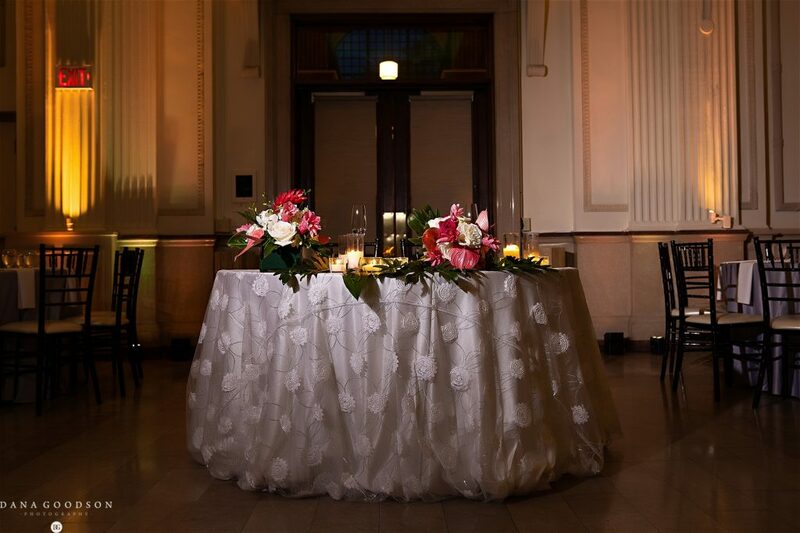 This flawless combination added a romantic ambience to the reception. 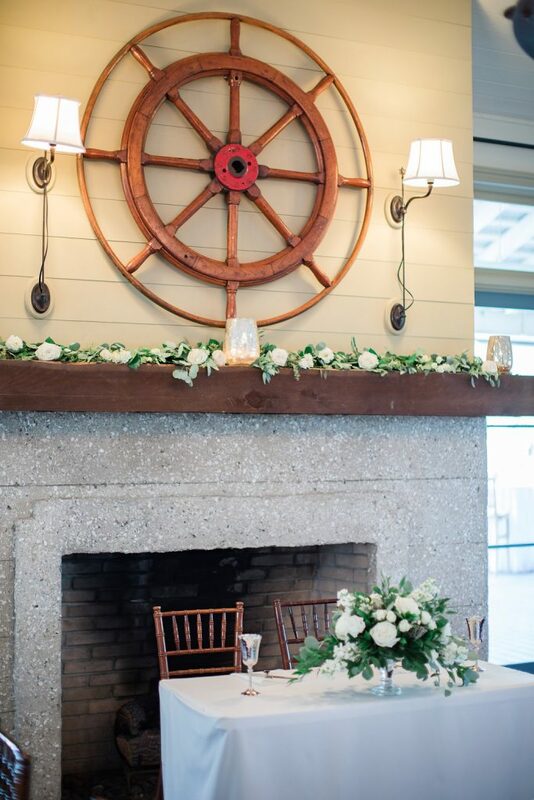 Mixed garland added the perfect touch to the seating chart.